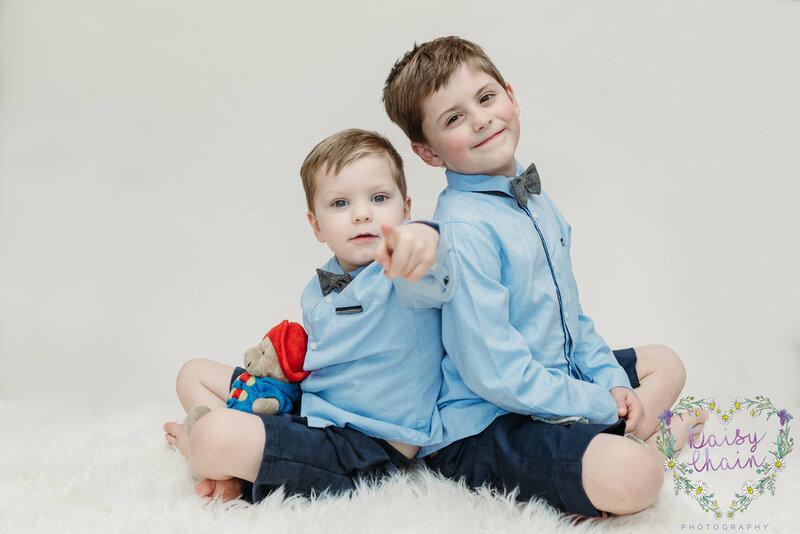 Ribble Valley & Lancashire Wedding and Family Photographer. 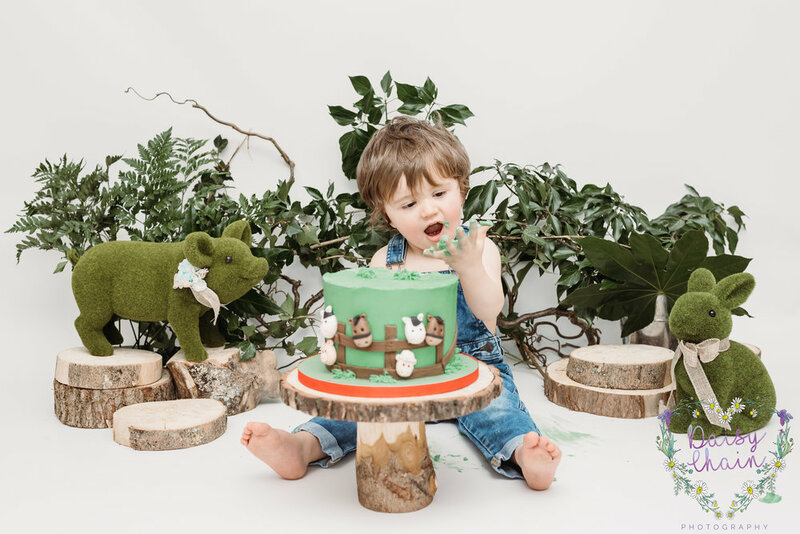 Earlier this week, I had a special little visitor for a cake smash session. 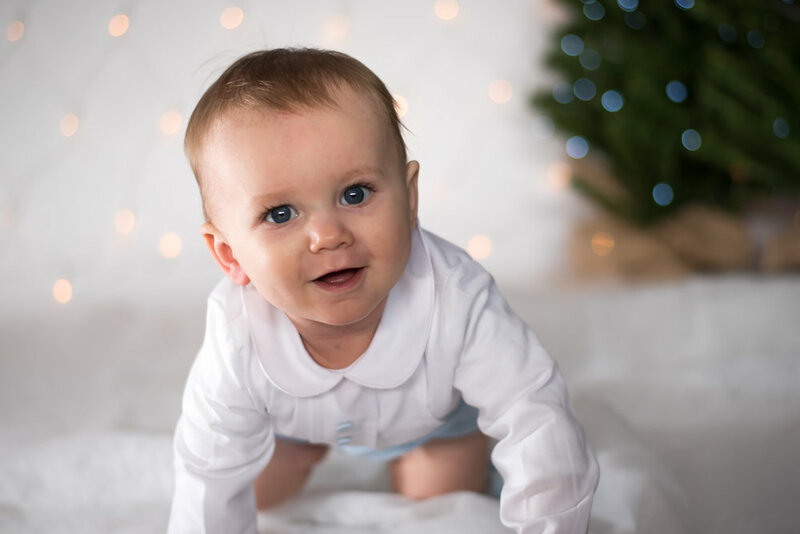 My gorgeous great nephew, George! 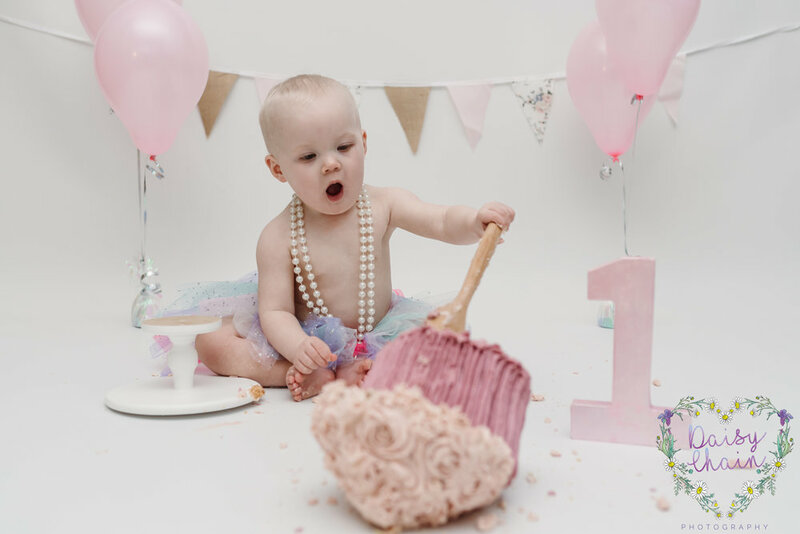 A couple of months ago, my niece had seen some of my cake smashes that I had been doing online. She wanted to do something special to celebrate George’s 2nd birthday. 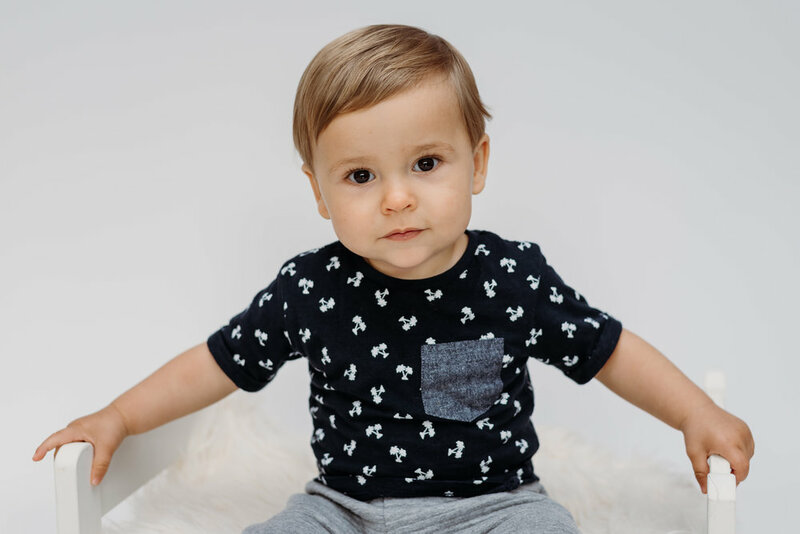 Poor George had a rough start to life when he got meningitis at just 4 months old. Luckily, he over came it, but it has left him completely deaf. He can now hear after having an operation and he now wears a special headband to help this. Read on, there is a statement from Bethan who explains his story. I wanted to make this shoot extra special. George and his family live on a small holding in Cumbria. They have a dog, 4 horses and a herd of Belted Galloway’s. I was telling my friend Jo from A Cake Occasion all about George. 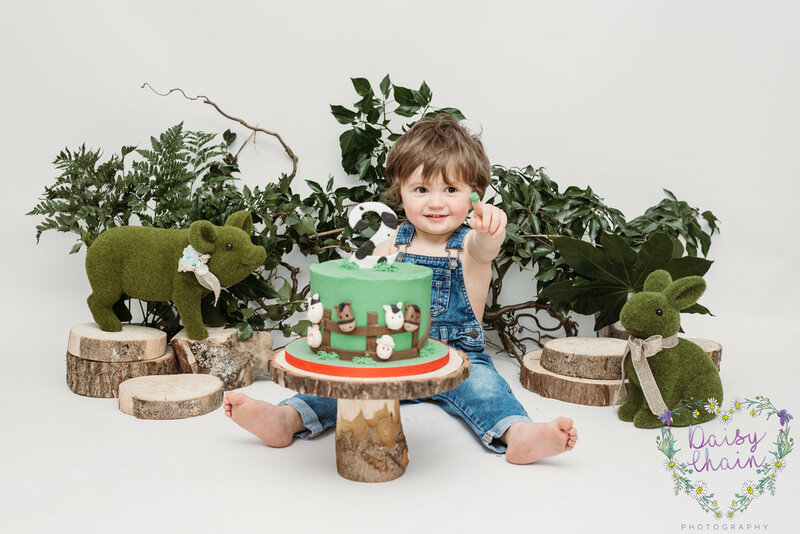 She was happy to get involved and make a themed cake for the shoot. I picked up some other bits and pieces of props whilst I was supposed to be doing something else. I have a habit of NEEDING to buy more new props…… Jo provided a rustic, wooden cake stand too. It originally came from Jen’s Rustic Wood. 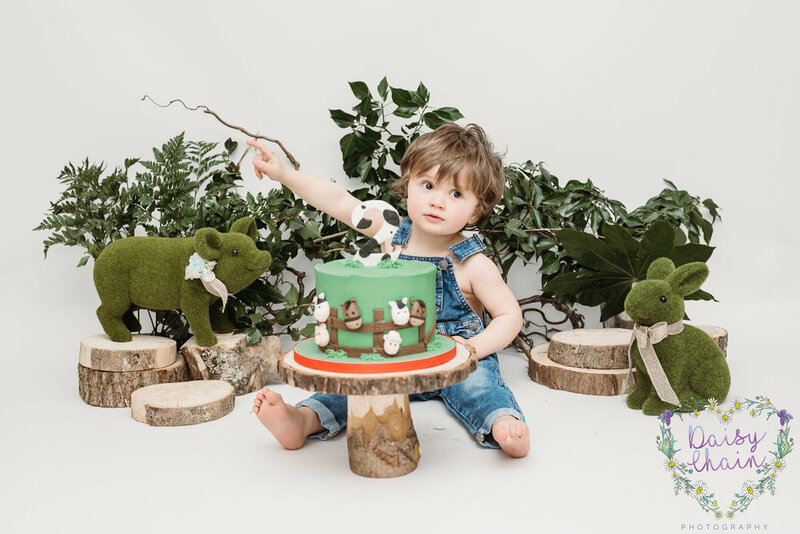 The set was finished off with some wooden slices from The Wedding Workshop and some branches and ivy from The Flower Girls, Whalley. It looked amazing! Bethan and George arrived mid morning. They had to drop Peter, George’s big brother off at school. Then they made their way down from the Lake District, Cumbria to mine in the Ribble Valley, Lancashire. George pretended to be shy for all of about 30 seconds. He then came for massive cuddles before nailing his photo shoot. Bethan wanted a mixture of him with and without his headband. George is a total star. He wasn’t phased either way. Without it, he could legitimately ignore us both and do his own thing. With it, he found his Mummy’s lion impressions hilarious! 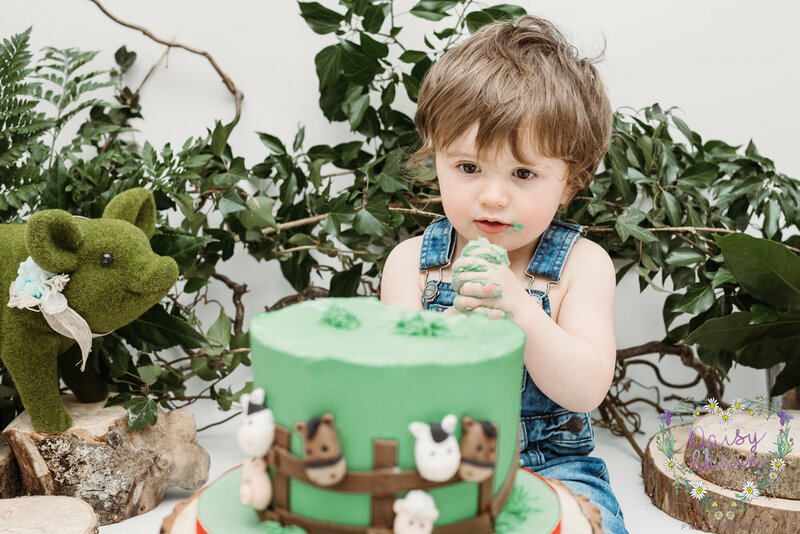 He really did make the most of bashing up his cake, stuffing his face with buttercream and then wiping the rest of it all over himself. I loved being with them both. Obviously they are family and I am a little biased. But they both truly are amazing. This little man has been through so much in his little life and he really is making the most of it now. I kid you not, he is a total whirlwind and it is brilliant to see. 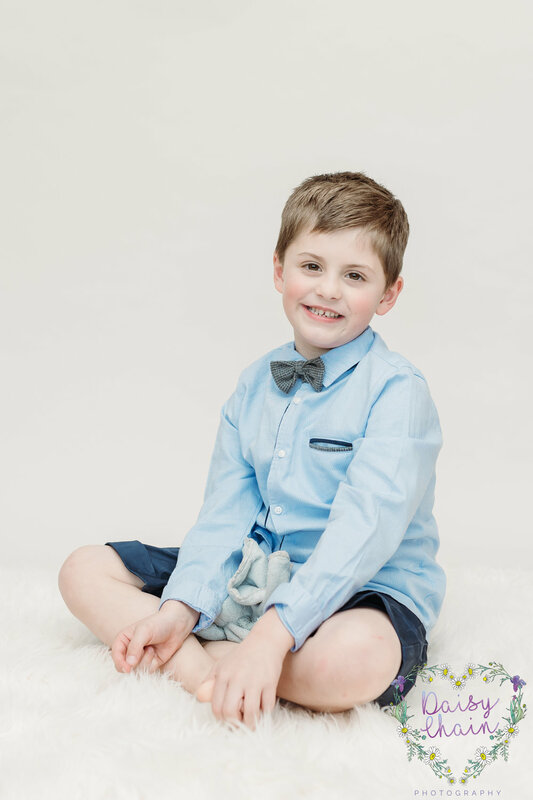 George contracted pneumococcol meningitis at just 4 months old. He was incredibly poorly and very nearly died! 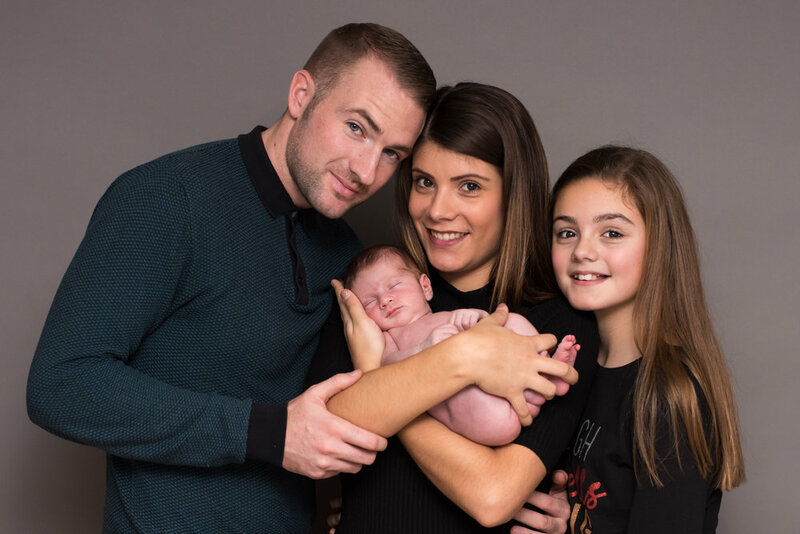 Thanks to the fantastic staff at Furness General A&E and children’s ward, along with Manchester Children’s hospital pediatric intensive care and of course, George’s incredible fighting spirit he survived. 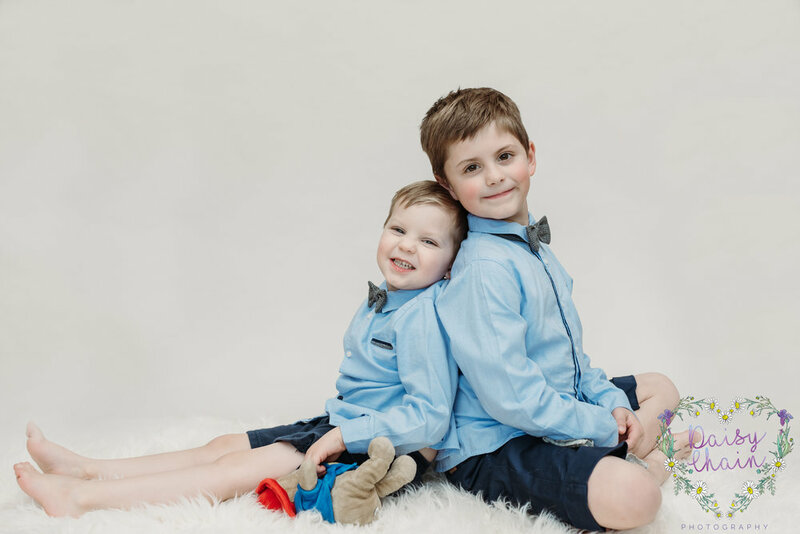 He suffered severe pain, seizures, blood clots near the brain and some gross motor issues. All of which seem to have hopefully been short term effects. He was however left profoundly deaf as meningitis destroys the cochlear (important inner ear component). 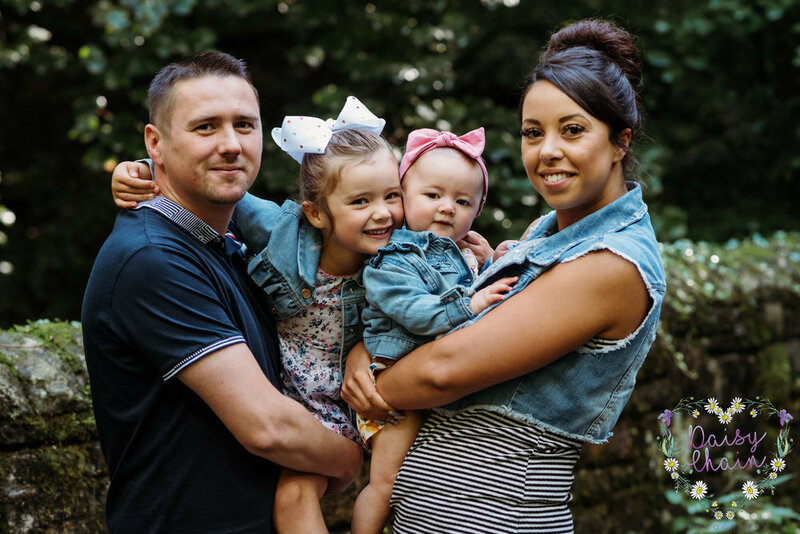 This then makes it incredibly urgent to have cochlear implants fitted as the cochlear can continue to deteriorate even after the Meningitis is gone. So within weeks he had surgery at RMCH and was fitted with his implants just in time for his first Christmas. He now has brilliant hearing and is coming along brilliantly with his speech. 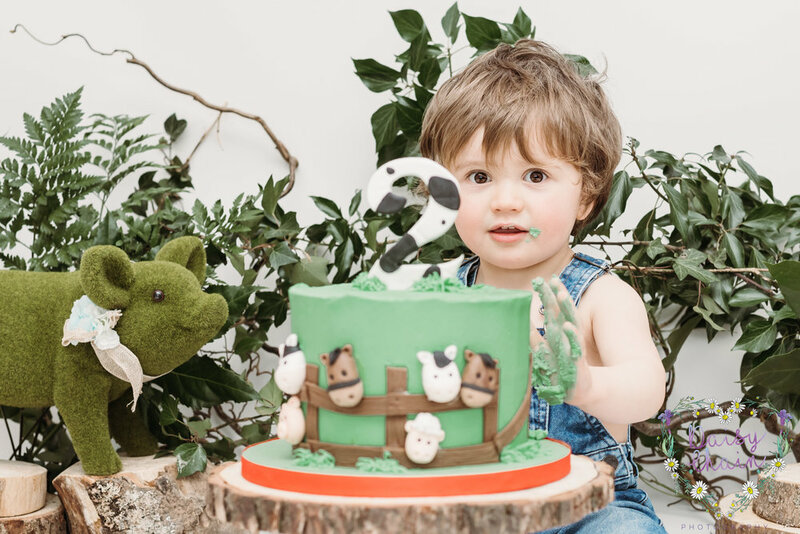 If you would like more information on cake smash sessions (or any other session), please get in touch. February has been quiet for weddings, although busy for wedding bookings. 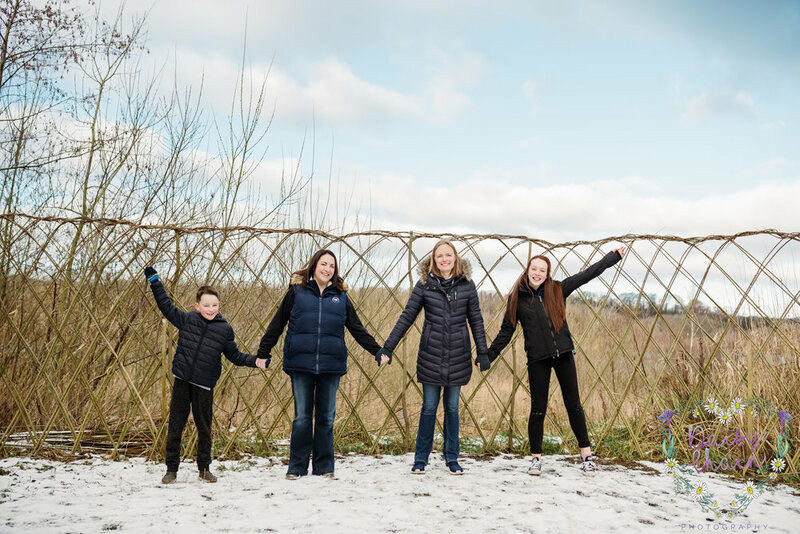 The good thing about not having weddings or wedding editing this month is, I have been able to fit some families in for a photo shoot. Jess, has been trying to get her gorgeous boys in for a while. School for Fred and busy weekends for us both has made it a little difficult to coordinate. We took full advantage of the half term and got the boys in! 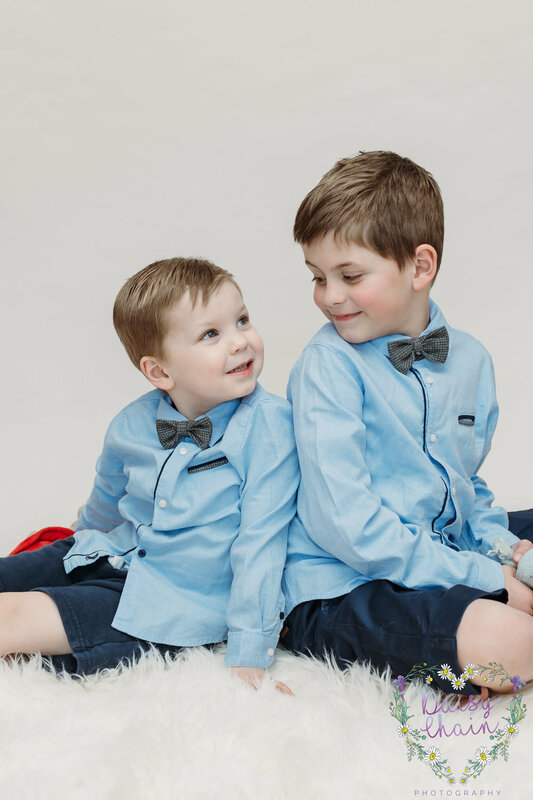 Arthur and Fred arrived wearing matching shirts and bow-ties. The looked absolutely adorable! Arthur came in and made himself right at home! Both boys were keen to get started. Fred had a very serious face. He meant business. Arthur wanted to play and also give me cuddles. How could I refuse? I didn’t use any props with the boys. 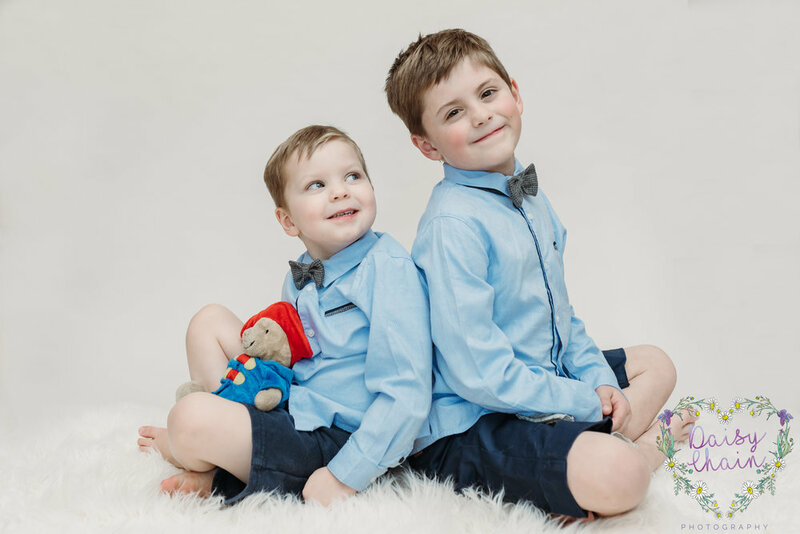 They just had a simple set up and brought along their favourite teddies. These brothers were so sweet. You could just see how much they adore each other. There was lots of hugs and kisses going on. 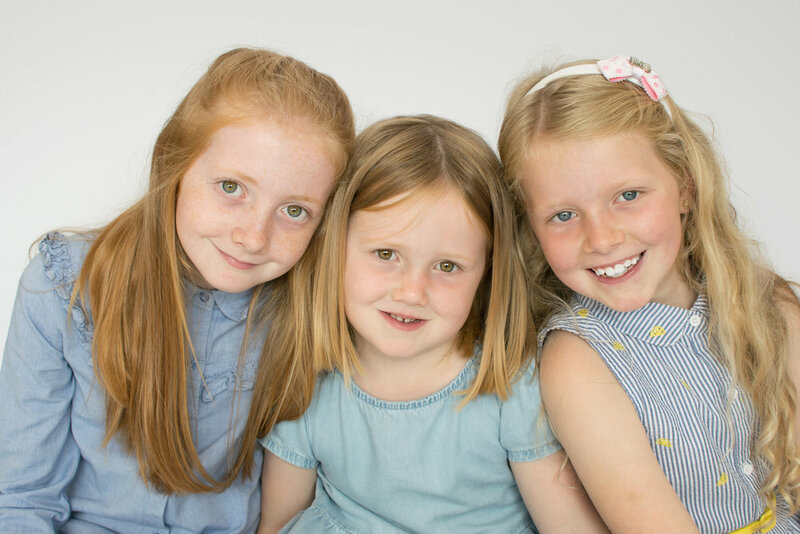 I love being a Ribble Valley family photographer. They say never work with children or animals. Well I love working with them both! I must be mad! 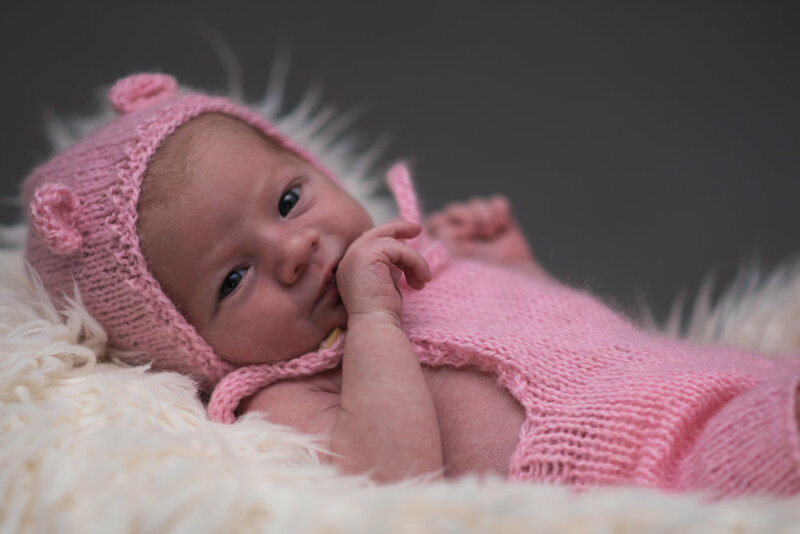 I just love being a Lancashire newborn photographer! 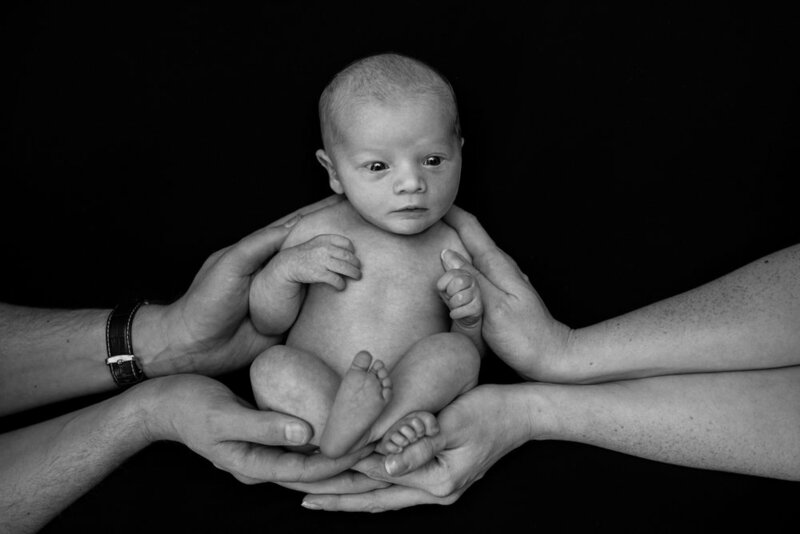 I say that a newborn session can be booked any time after a 20 week scan. 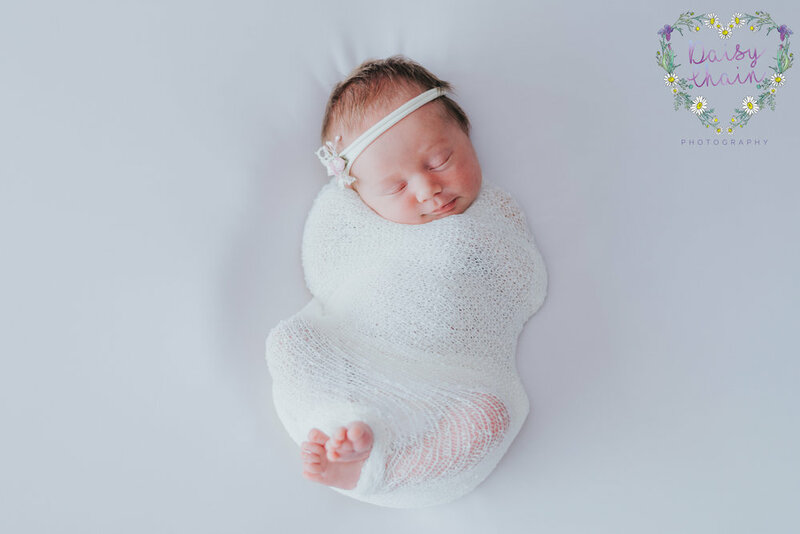 I should say, I limit my newborn sessions so that I have a little bit of flexibility to change those dates should baby be early or late. 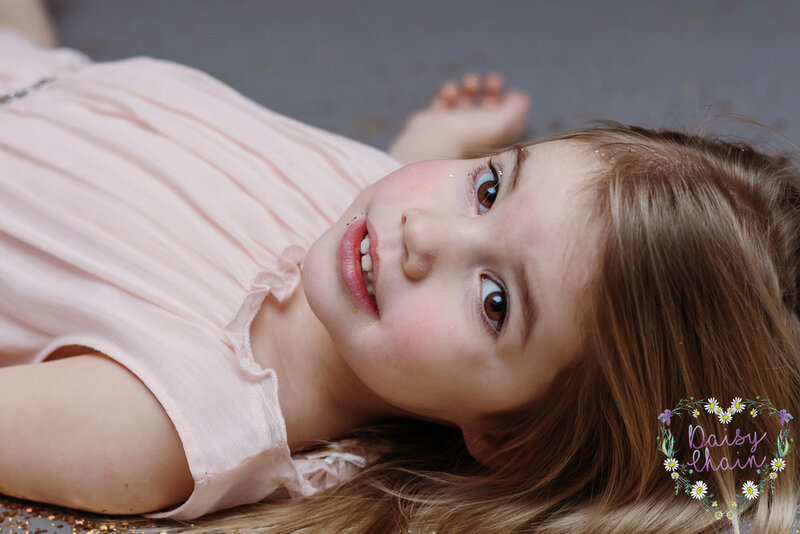 Anyway, on this occasion, Rosie contacted me just a week before her session. She has seen my work months ago and had been meaning to book in. She got side tracked, as you do. But luckily for her, I had some availability. 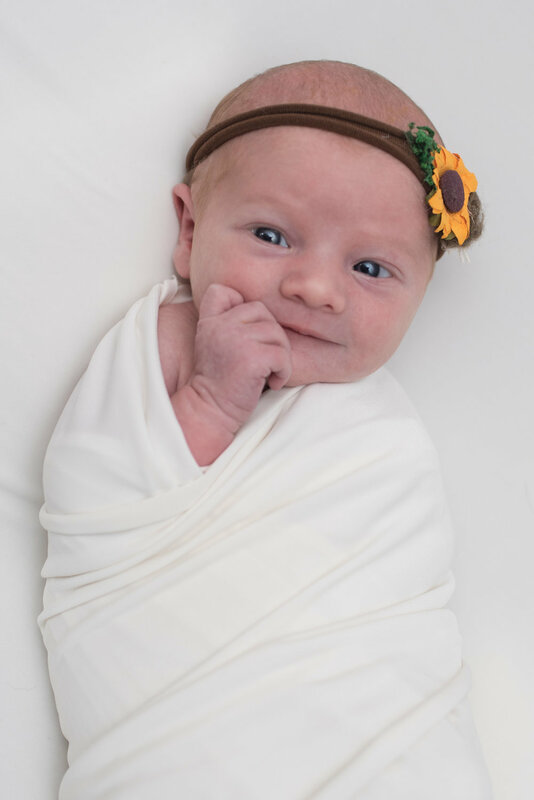 A week later, 9 day old Marnie came to visit me at my studio style setting in Langho. She brought along her Mummy and Daddy. They only live in Rishton, so just over the hill from me in the Ribble Valley. Marnie arrived sleeping. I could see that she looked tiny. She was just over 6lb when she was born. She had a quick top up of milk and she was ready to go. Because she arrived asleep, I was slightly concerned that I would upset her by getting her undressed and in a newborn wrap. She didn’t stir! That was pretty much her throughout the session. 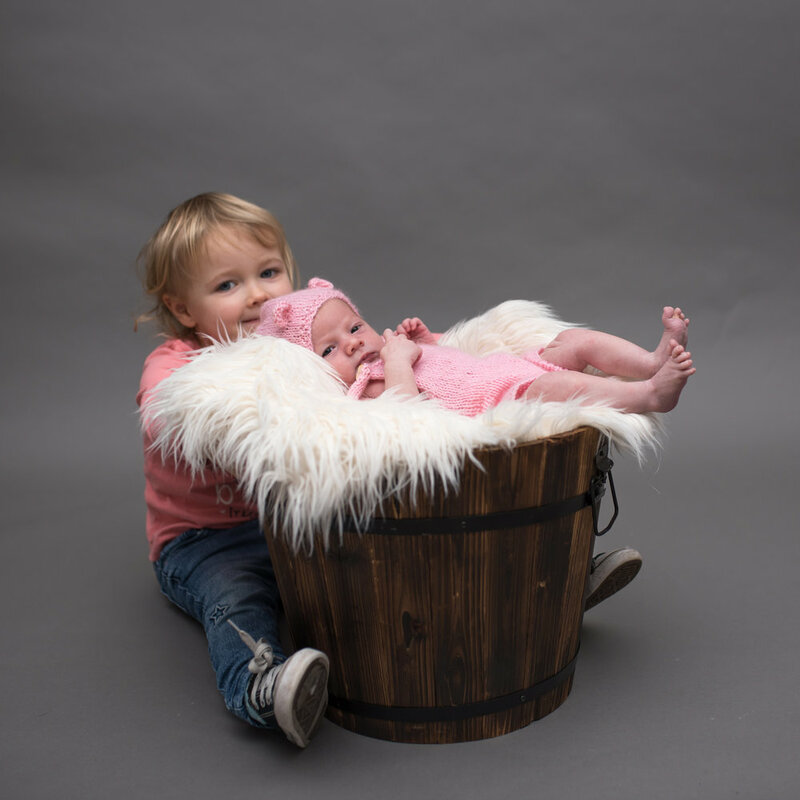 I used various wraps, faux furs and props before moving her on to my newborn posing beanbag. Not a peep out of her for practically the whole shoot. That being said, she did show me once or twice that although she is very small, she is also very mighty! Her legs and arms were super strong for such a little dot! 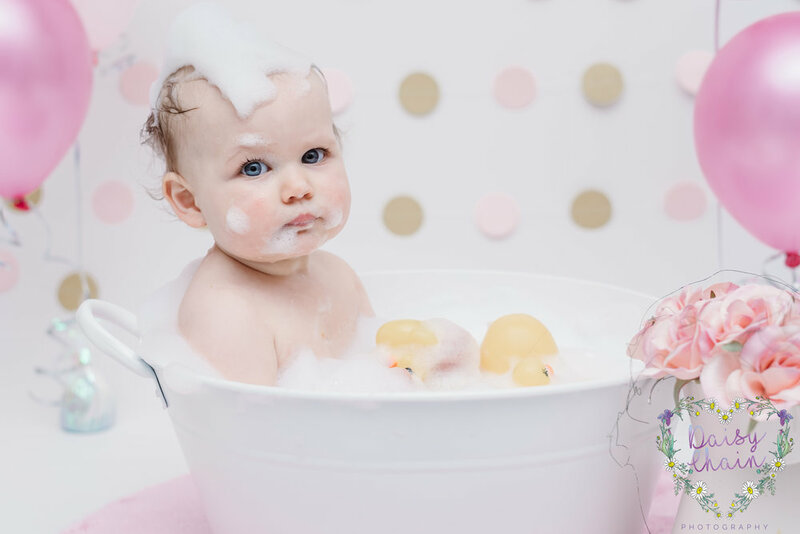 I loved Marnie’s newborn session. She was a total sweetheart, I got lots of baby cuddles and her Mummy and Daddy were lovely to be around. 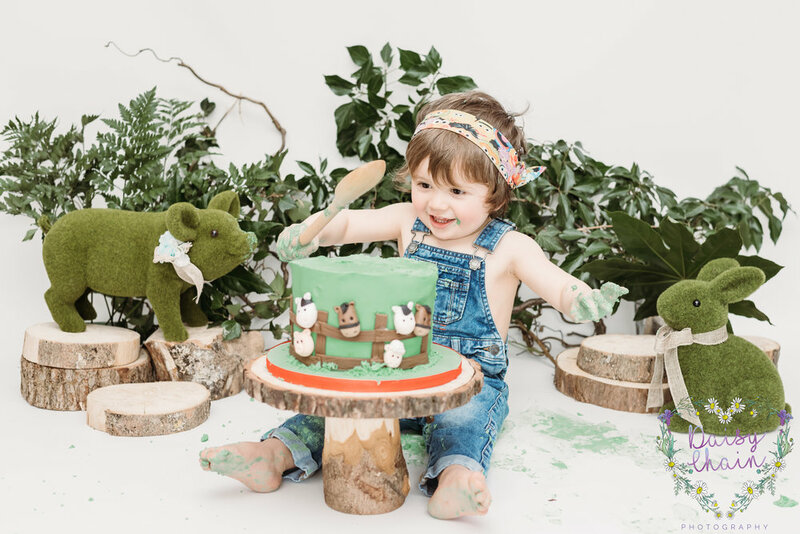 They’ve already told me that Marnie will be coming back for her cake smash and splash session and I can’t wait! 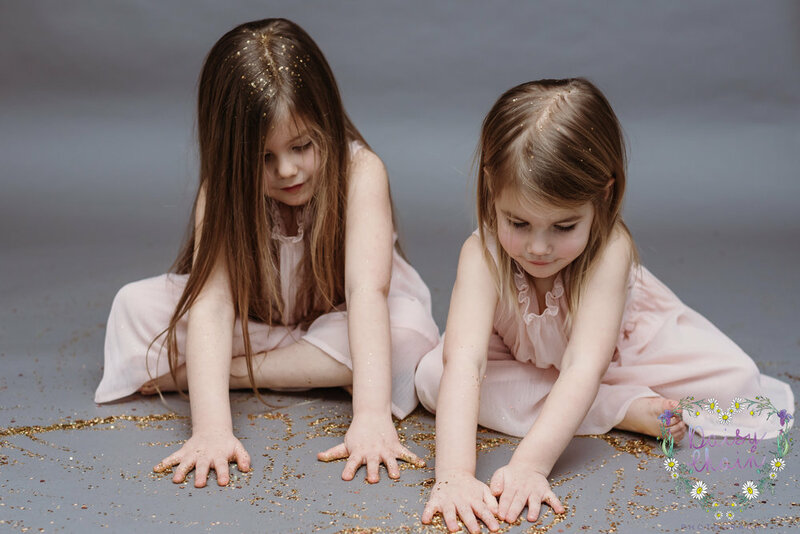 Here are some more images from this lovely shoot. I have known Leanne for a number of years now. I remember when her and Amy got together and when they got engaged. When they asked me if I would be their wedding photographer, I was over the moon. We met last year to discuss over a coffee (obviously!). Both Leanne and Amy told me how they hated having their photograph taken and were a little nervous about it. So we decided on doing a pre wedding session to give them a chance in front of my camera before the big event. 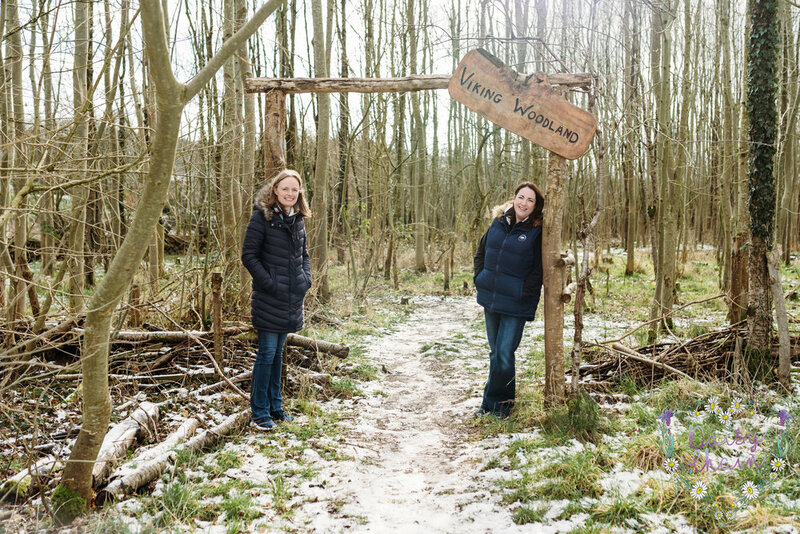 The lovely ladies live in Chorley and I live in Langho (Ribble Valley). 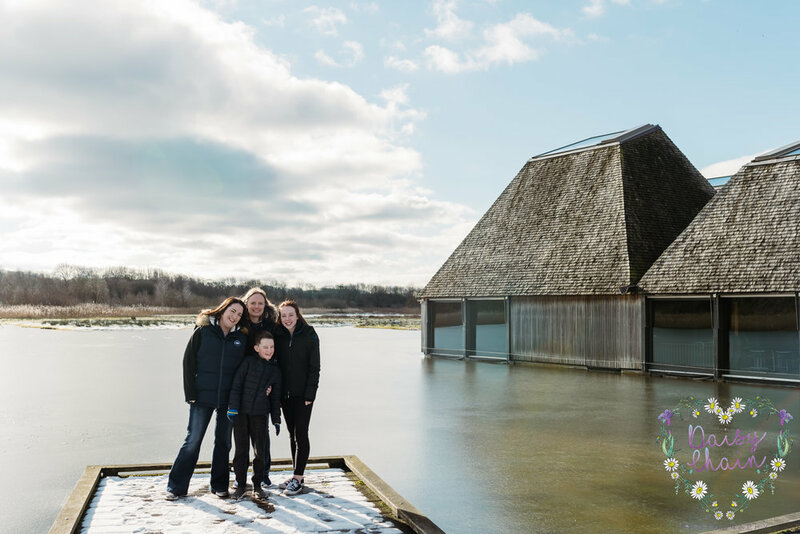 We decided that Brockholes Nature Reserve at Preston was the perfect place to meet. Still feeling nervous about having her photograph taken, Leanne asked me if she could bring her two children along to hide behind. I said that it was fine, as long as she agreed to have at least one photo taken with just Amy. On the day, they both settled into it really easily and soon realised that they had nothing at all to worry about. It was a lovely, but bitter cold morning. I am so excited to be shooting their wedding at Beeston Manor, Preston next month. I totally love being a Lancashire wedding photographer. It’s the best job ever! 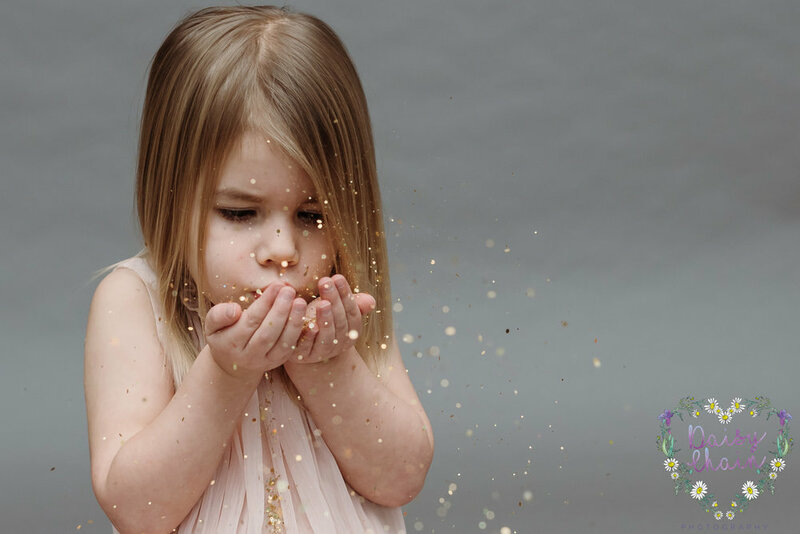 Fancy a photo shoot with a difference? 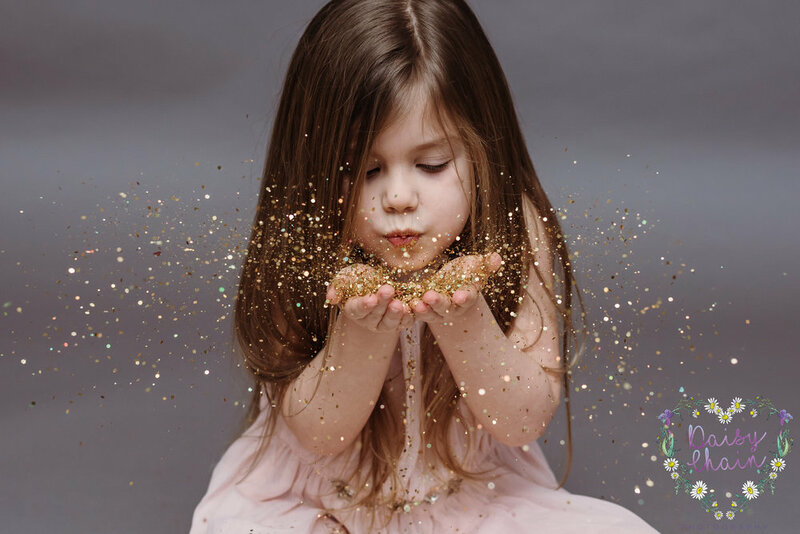 Imagine it’s raining glitter! How amazing does that sound? This is what dreams are made of. 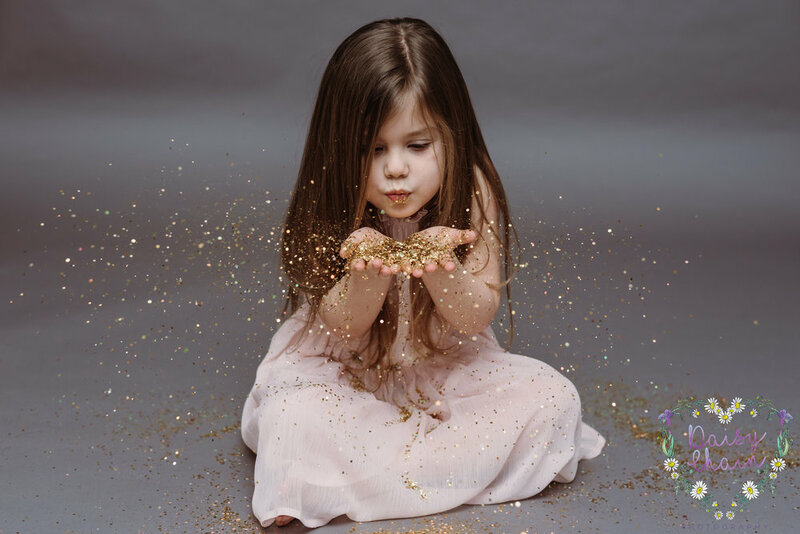 Who doesn’t love glitter? (Well, in honesty I don’t. It gets everywhere! Shhhhhh) But, it looks totally incredible in photos! This is done in my Ribble Valley, Lancashire studio style setting. Meaning all this mess is at mine and not yours! Even better (for you). 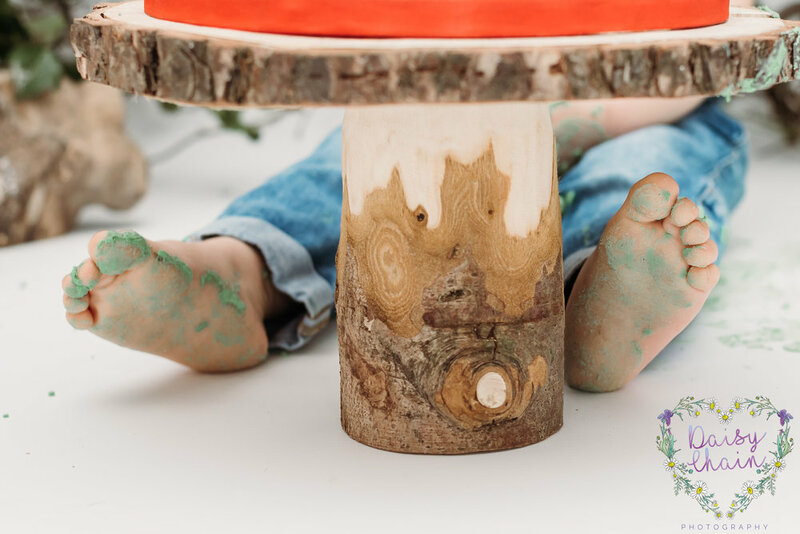 Children are in their element when they are playing in it. I find their smile is way more natural as they are having a blast! You don’t get that fake smile that they do whilst saying “cheese” (you will never hear me saying that! I don’t like forced smiles). This is aimed at children that are 3 years plus. This is because there is a small chance that glitter could get in eyes. 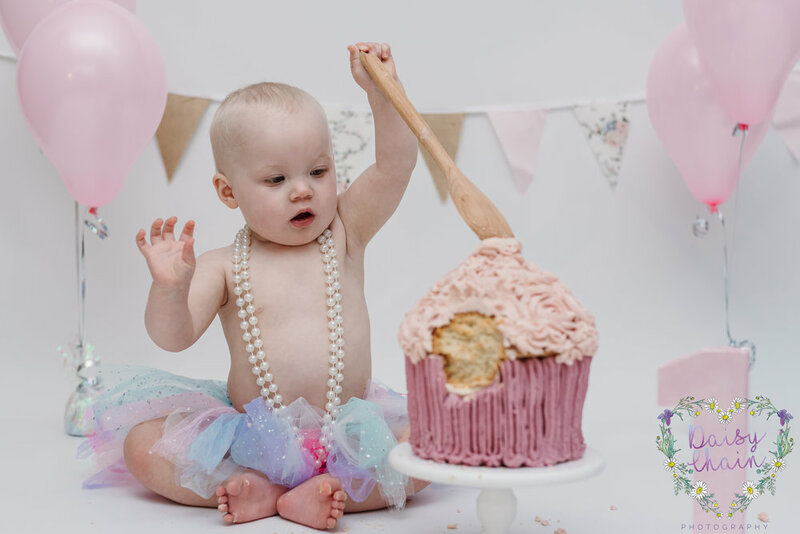 I originally decided I would offer these sessions as an alternative to a cake smash for birthdays. But, they can actually be done whenever as a bit of fun! Please drop me a message to find out more. I first met Aria when she was just a few days old. 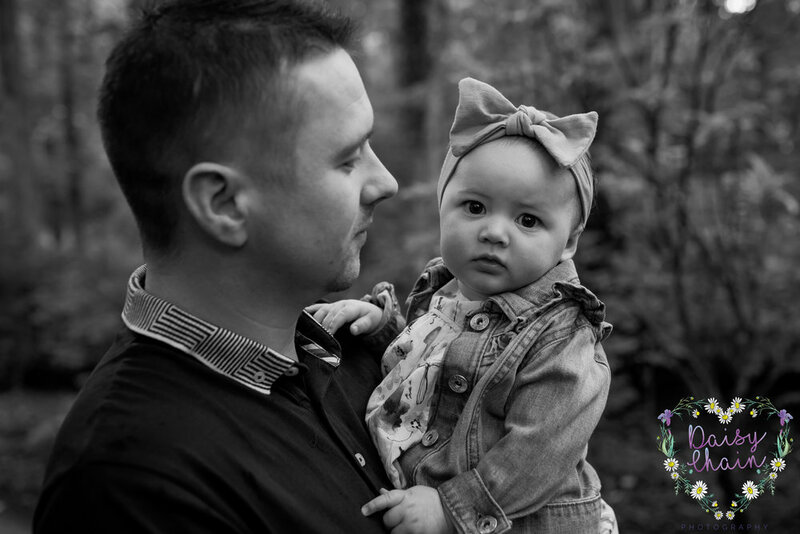 Her Mummy had been in contact with me whilst pregnant and booked a newborn session with me. 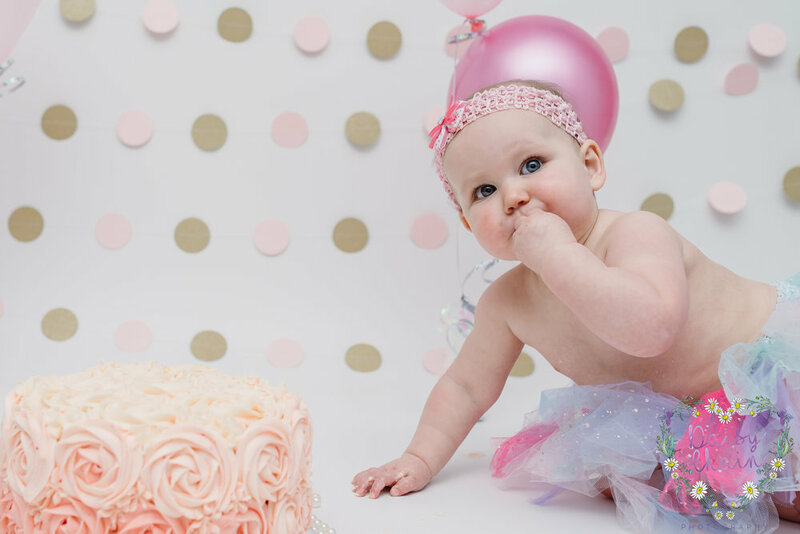 Since then, I have seen her a couple of times; once for a Christmas photo session and then more recently, she came for a cake smash and splash session. 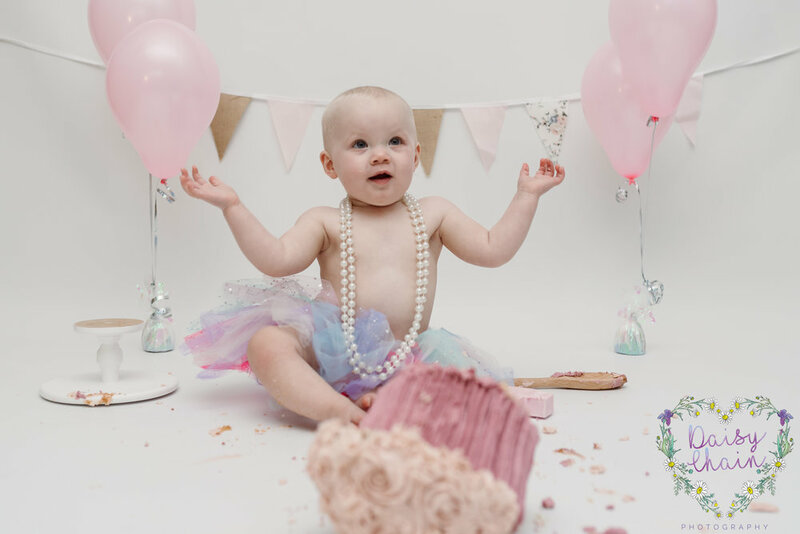 This was to celebrate her first birthday. 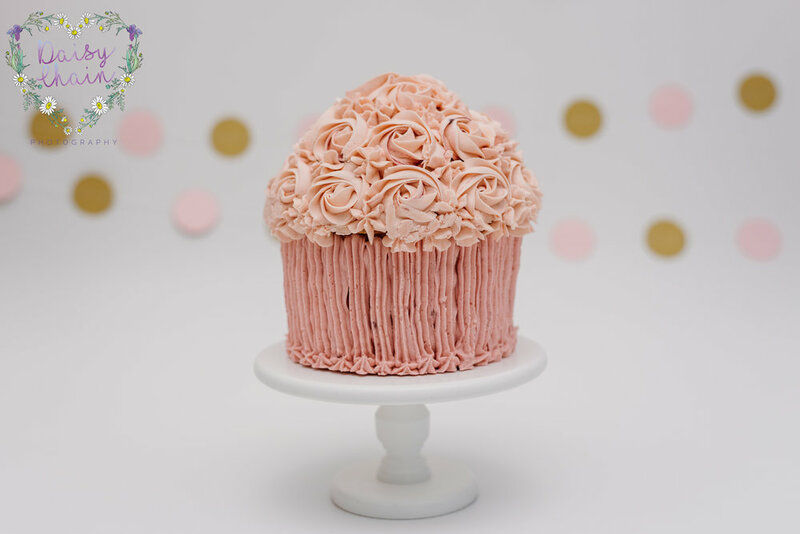 I ordered a beautiful giant cupcake from Ebella, near Clitheroe, Lancashire and collected it the day before. I also used pink helium balloons, vintage bunting, pearls and a tutu. 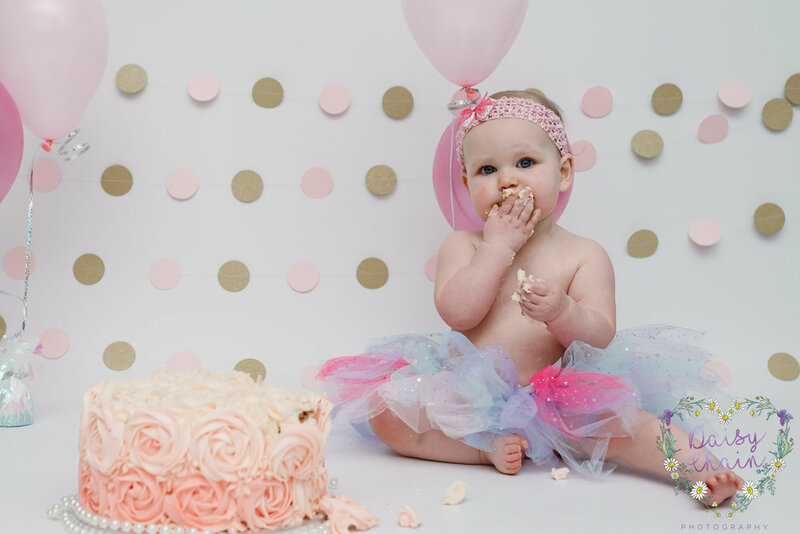 Who doesn’t love a tutu? 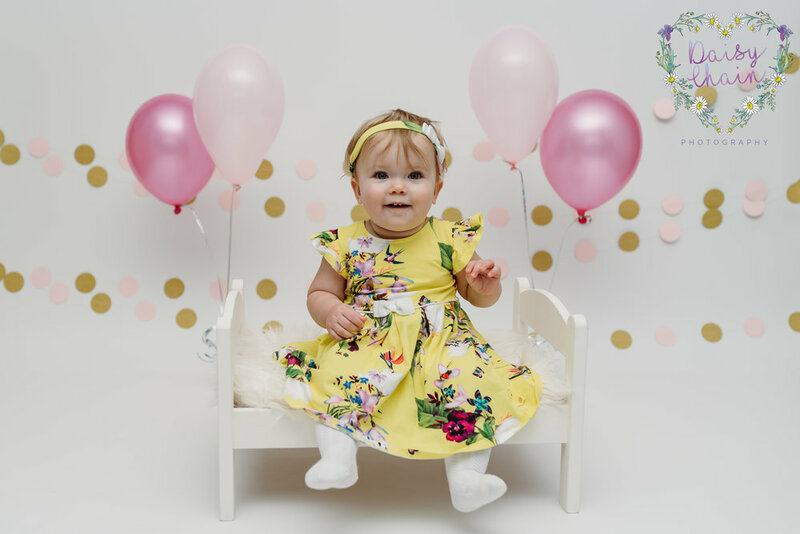 When Aria arrived, she was keen to get to the balloons! She didn’t need any settling in. She is a pro at this. 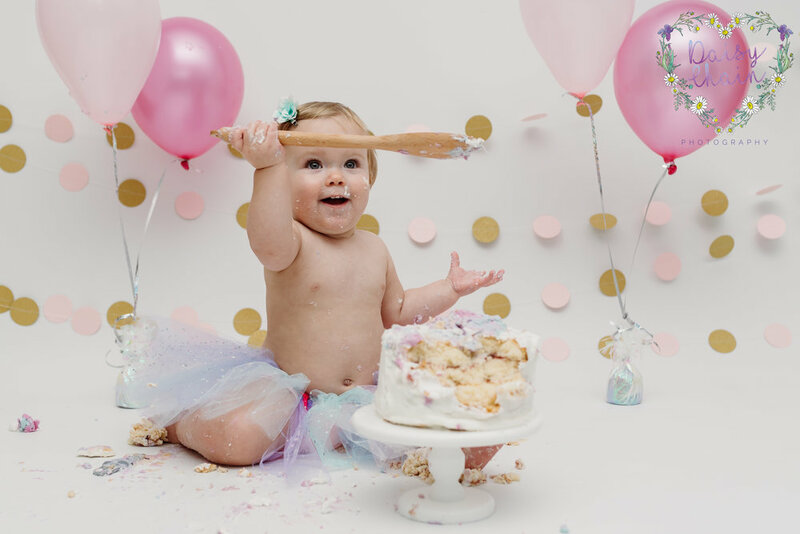 She preferred to smash the cake with a wooden spatula rather than use her hands. That’s fine, anything goes. She found it so amusing when she knocked the cake completely off its stand! At this point, she thought it would also be funny to come and climb on both me and her Mummy. 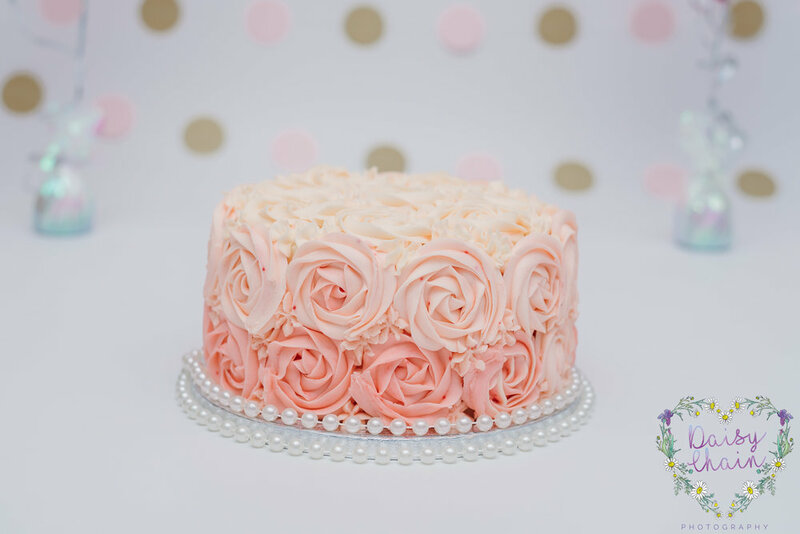 Don’t forget, she was now covered in buttercream! 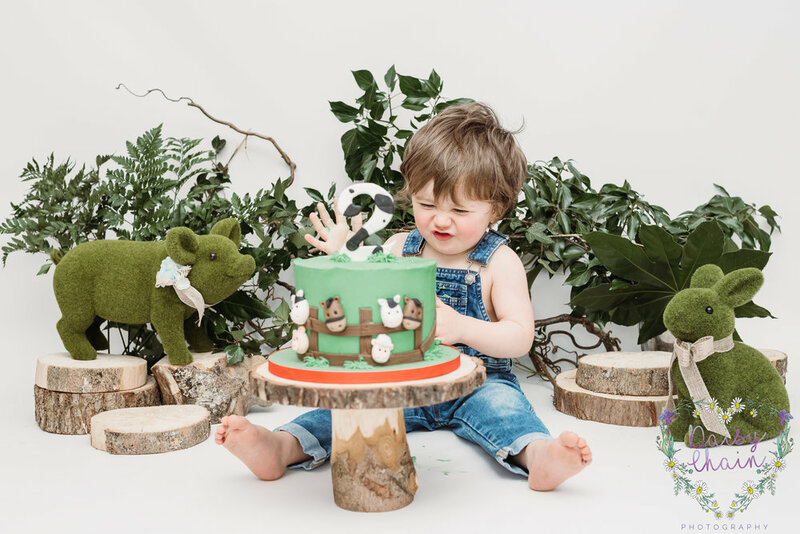 This happens in most cake smash sessions in fairness. I often go to collect my own daughters from school covered in mess. Oh well, I am not bothered. 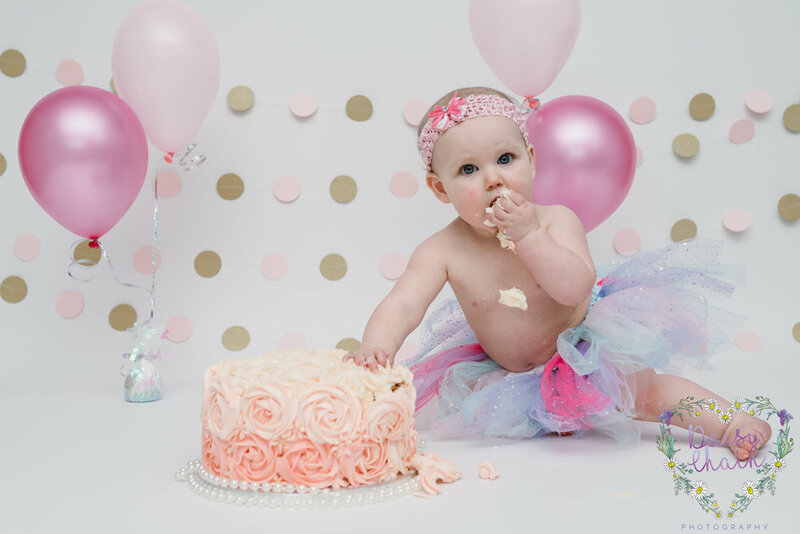 Aria was now done with eating icing and cake.So it was now time for the splash part of the session. The children tend to love this bit. 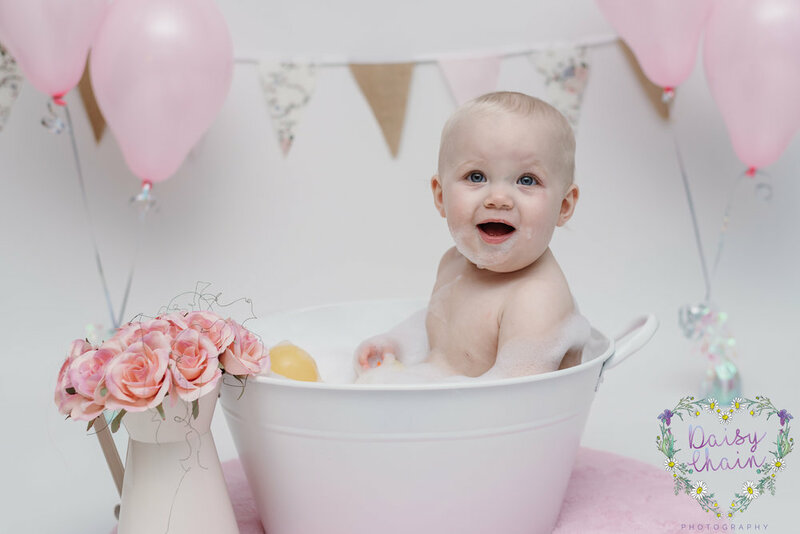 But again, who doesn’t love a splash in the tub? 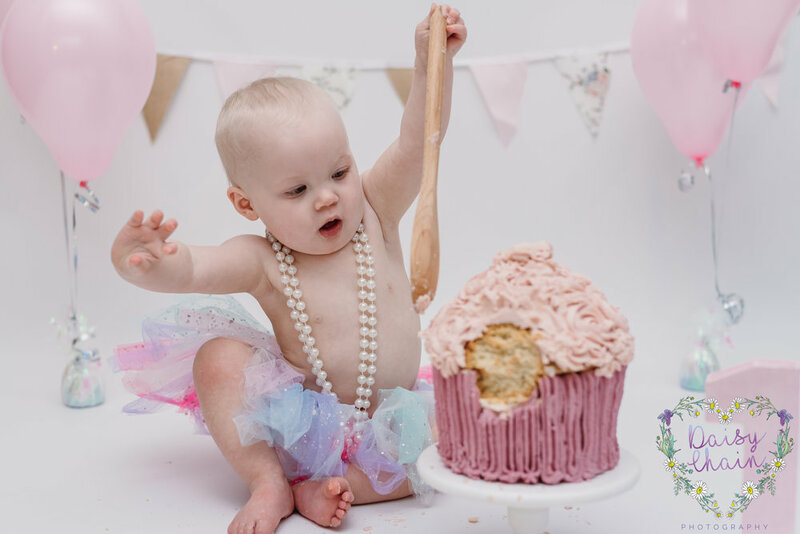 She decided that the cake hadn’t satisfied her and tried to eat the rubber ducks! I can’t wait to see Aria and her lovely Mummy again in the near future. We always have so much fun! 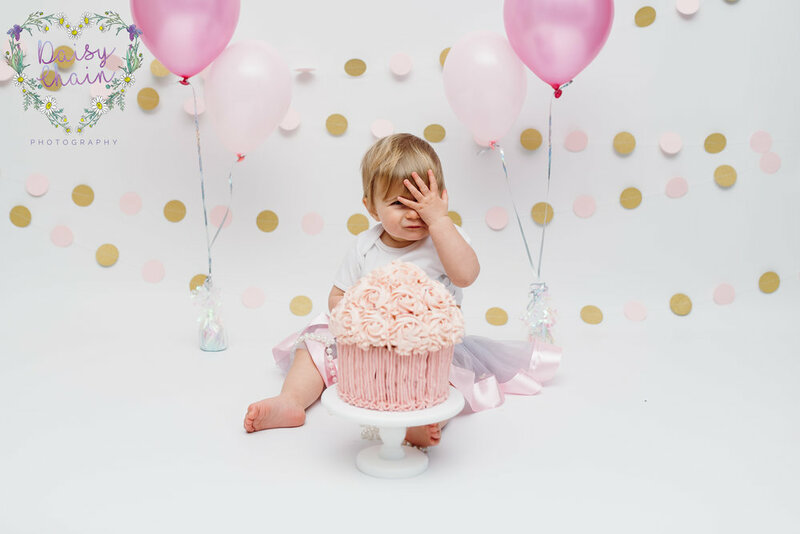 If your little one is about to have a special birthday and you fancy celebrating with a cake smash and splash session, drop me a message. I’d love to speak to you. I am based in Langho, just outside Clitheroe. I am based in the beautiful Ribble Valley, close to Clitheroe, Lancashire. 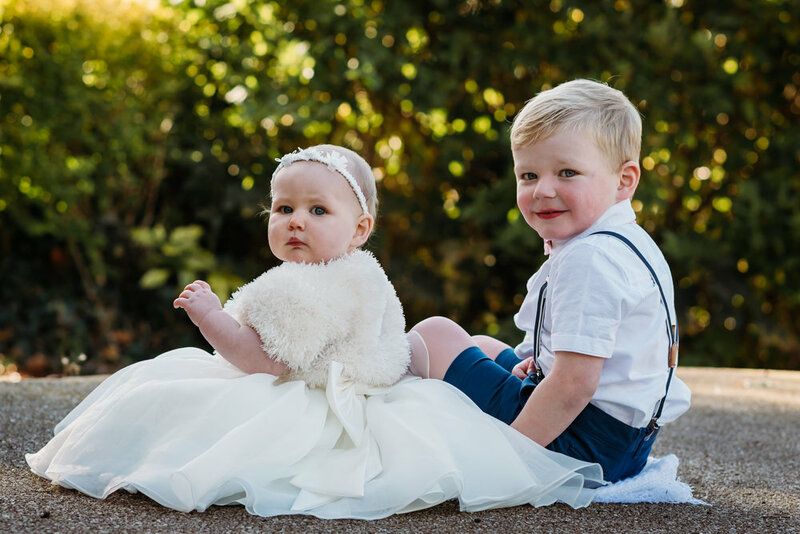 I am not only a wedding photographer, I am also a newborn and family photographer. I first met Erin when she was only a few days old. 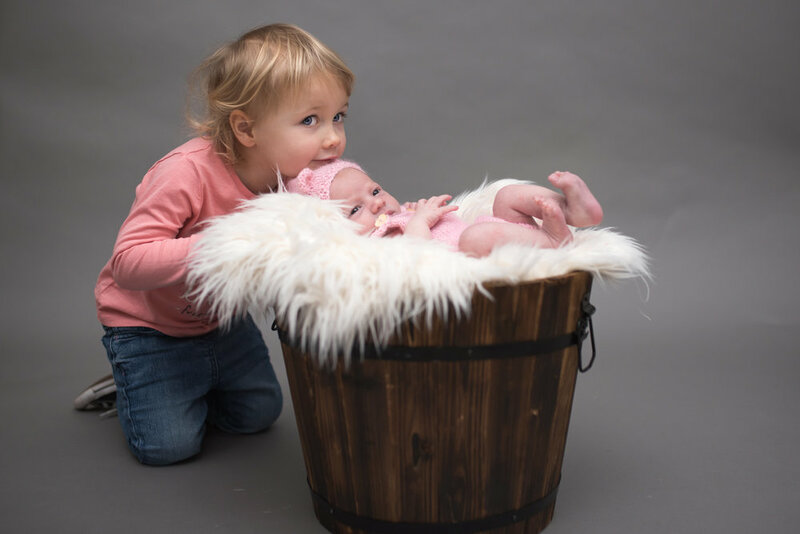 She had a newborn session with me and also brought her big brother along for good measure. 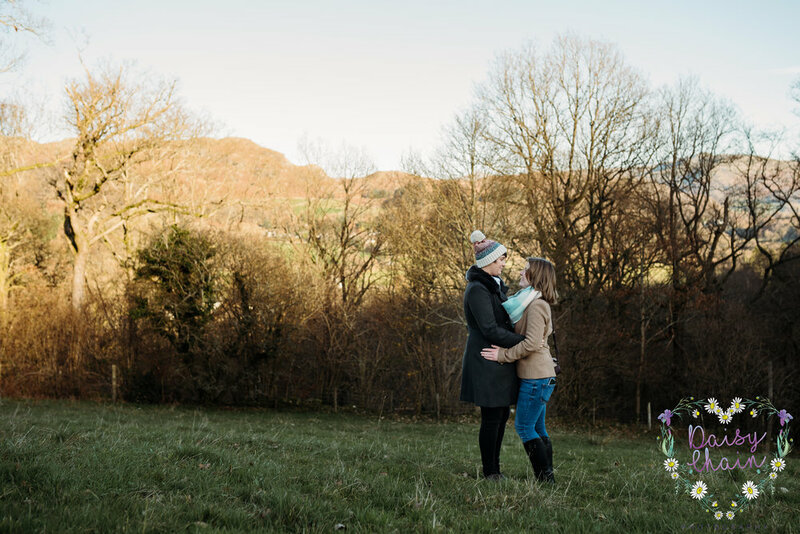 Since then, I also saw her for a autumn family shoot at Clitheroe Castle. 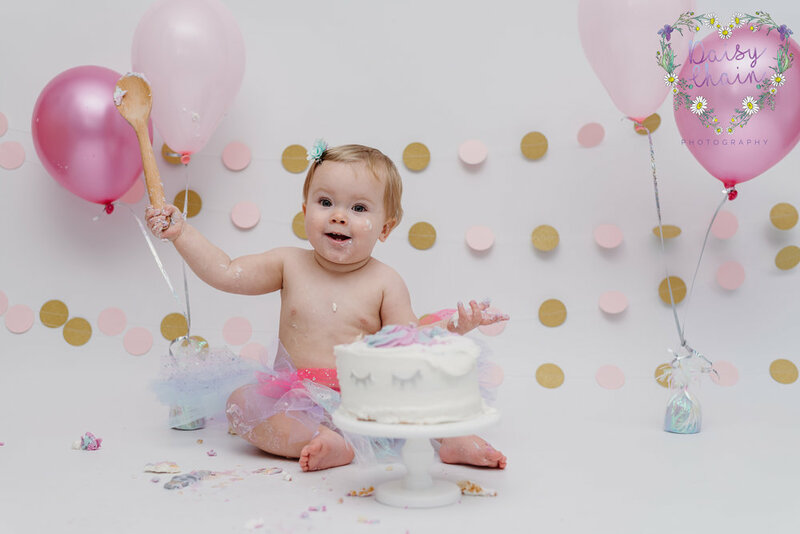 I was thrilled to bits that she came back to see me to celebrate turning one with a cake smash and splash session! Jansje (aka Mummy) said she wanted a girly, ombre cake. So I got the lovely ladies at Ebella to make one. It was perfect. Just what we were after. 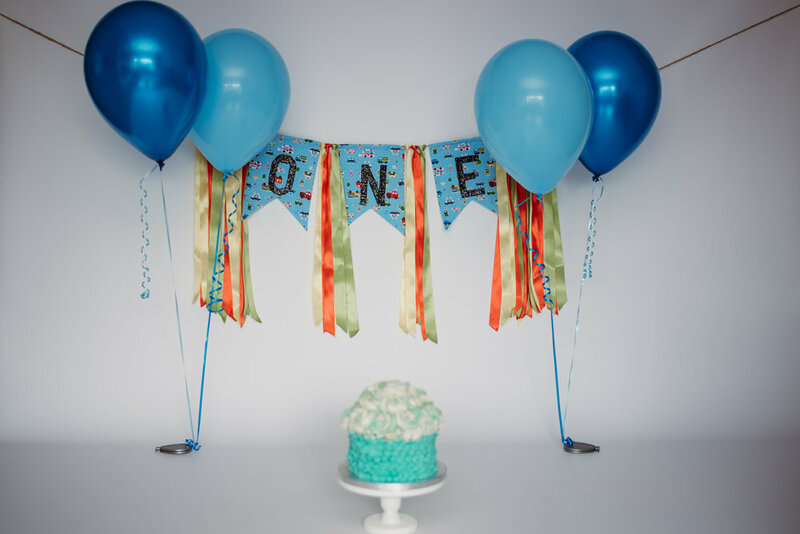 It looked great with my helium balloons and other accessories. Erin arrived. She greeted me with a big, gummy grin. Still no teeth for this little lady. I even got a big cuddle straight away. I LOVE cuddles! 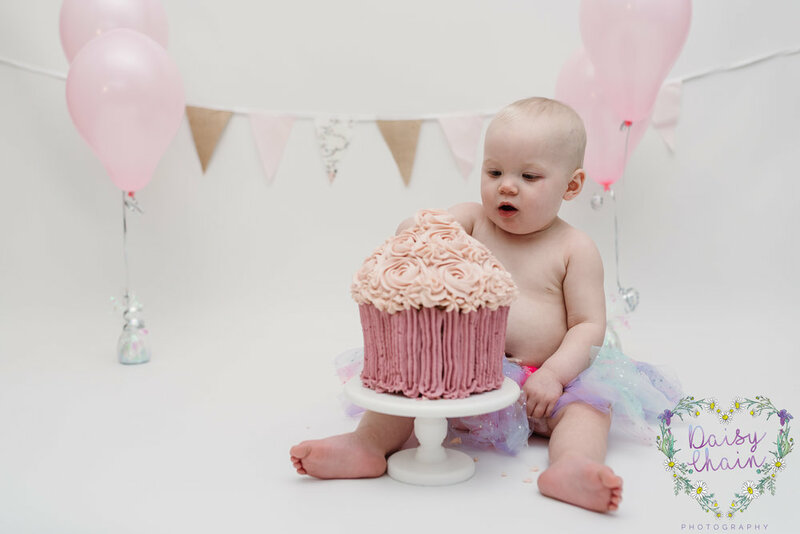 She then spotted the cake and balloons and was keen to get started. 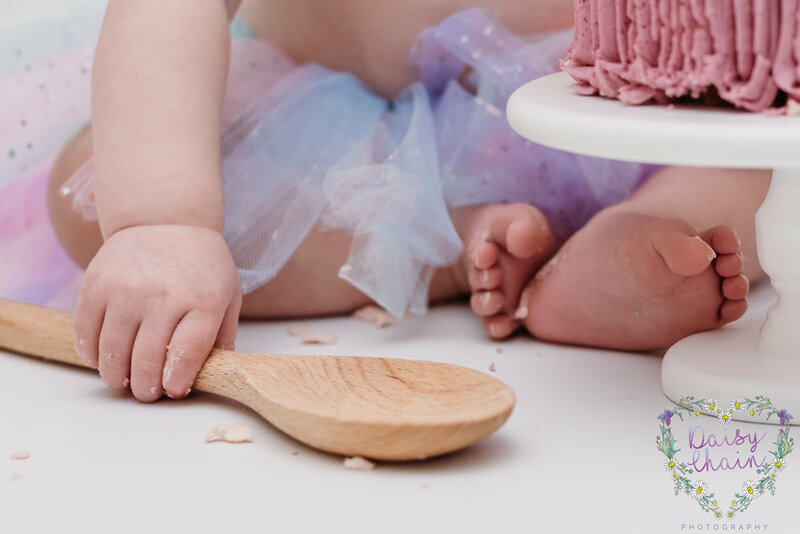 Some babies need some encouragement to get started on the cake. Erin did not! She dug straight in; both hands, both feet. I was pretty sure she was going to face plant it at one point. She refrained! 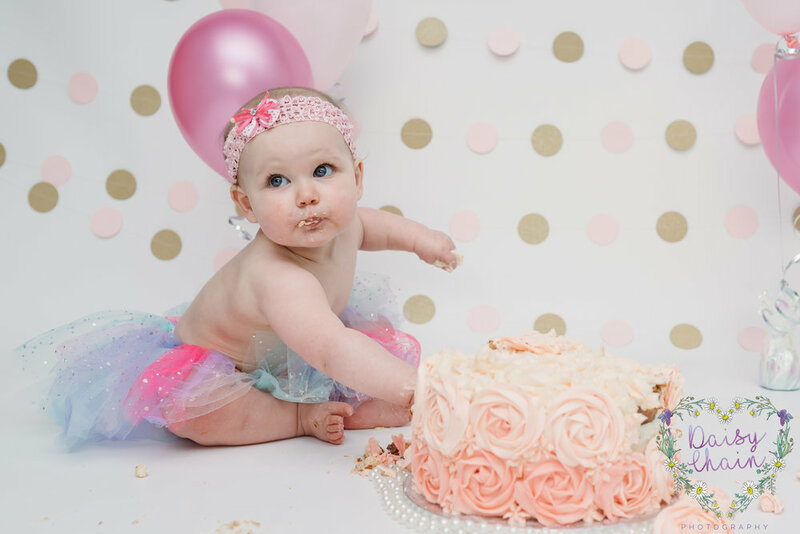 However, she did do something that no child has done at my sessions before….. She started to twerk on the cake. Laughing about it as she did. Hilarious! Her Mummy claims that she hasn’t picked that up off her. 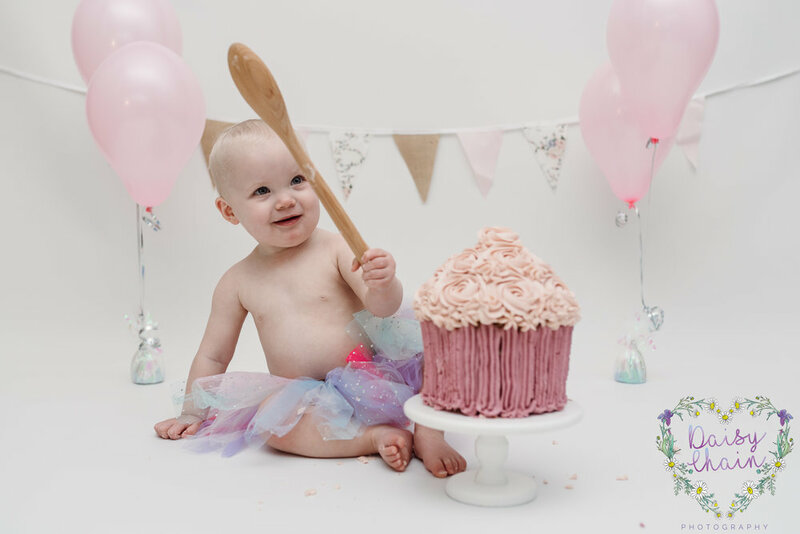 After she had got herself absolutely covered in pink buttercream, it was time for a clean up in the splash part of the session. I have a lovely little cream trug that I use for this part. It is the perfect size. 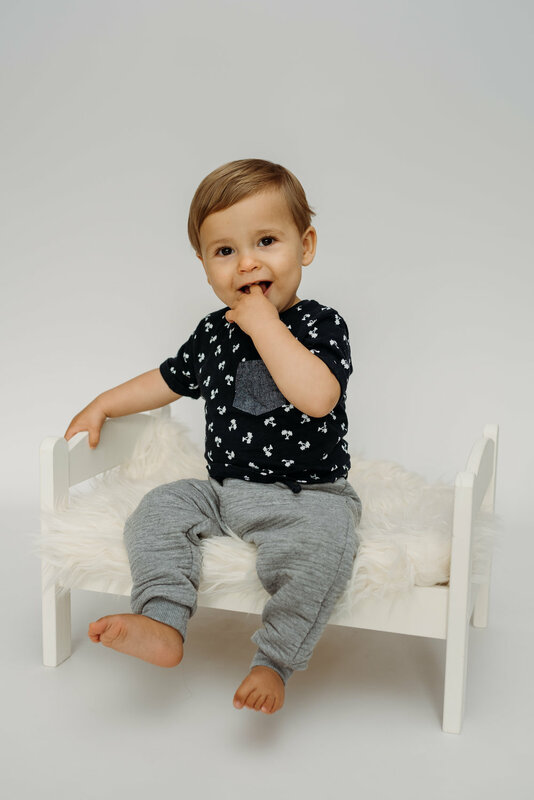 I often use this in my newborn sessions too (with blankets instead of water!). Erin loved it. 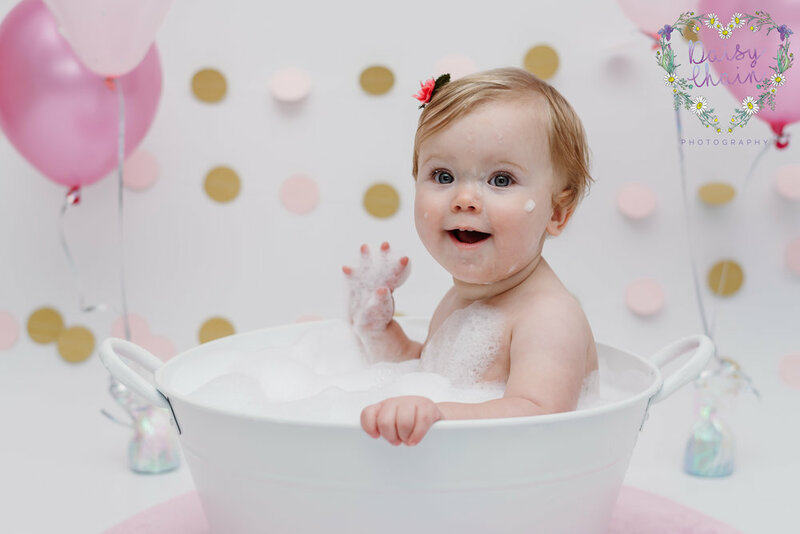 She was so happy to be splashing around in the bubbles and playing with the family of rubber ducks. She even tried to eat them too! I do love it when a family return for more sessions. It’s fabulous to watch them grow! I can’t wait to see this family again in the near future. At the end of 2017, Lou got in contact with me. She had seen on Facebook that I was a Lancashire wedding photographer and she was keen to tell me about her engagement to Becky. 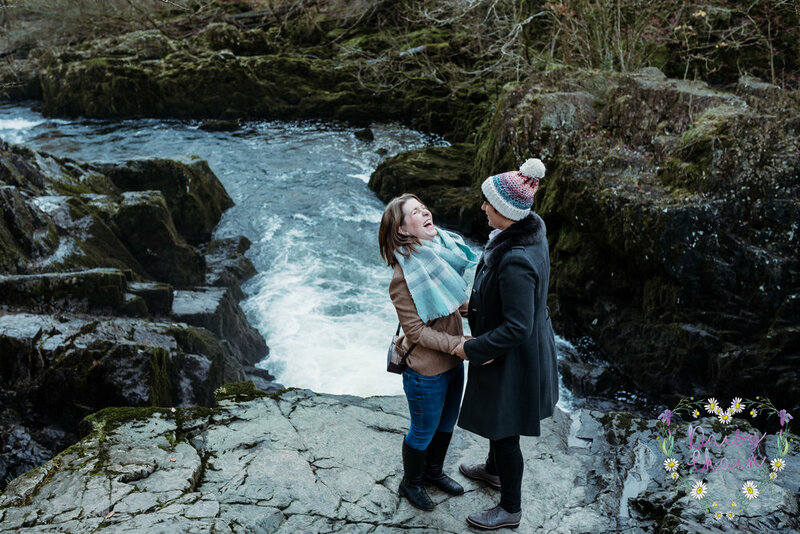 She told me how she had been planning to ask Becky to marry her, but at the same time, Becky was planning on asking her! We arranged to meet up and discuss over a coffee. We all know how much I love a coffee and a natter! 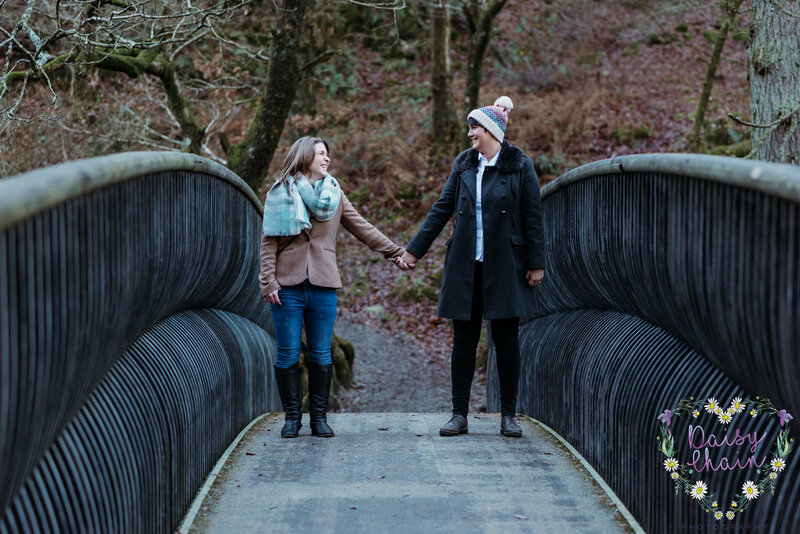 The ladies had got engaged at Skelwith Bridge, Ambleside and had booked their wedding for 2019 at Salmesbury Hall, Preston. Without giving too many details away, their plans sound awesome! I just love meeting up with couples, especially when they are as cute as this pair. We had pretty much sealed the deal when we said our goodbyes on the car park. As I was walking to my car, I glanced round at them and caught them having a cheeky little kiss. Awwwwww! 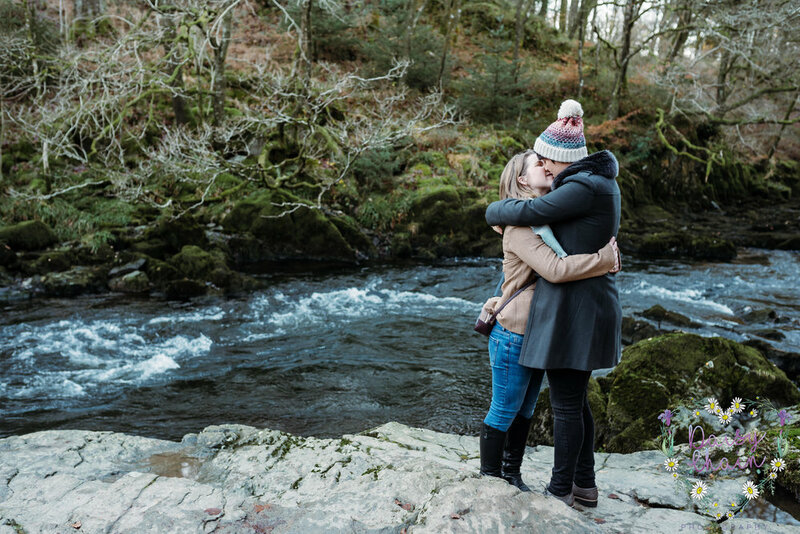 Lou and Becky had an engagement shoot included in their wedding package. So a couple of weeks ago, I met them at Chester’s By The River, Skelwith Bridge, Ambleside. This is where they were when the big question was popped! 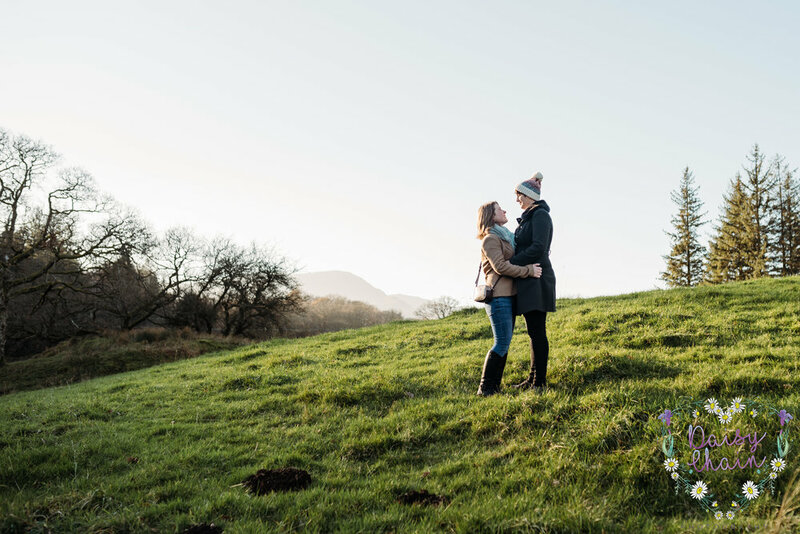 It was the perfect place for them and it was great for me as I meant I got to visit some family whilst I was up there (I am originally from Ulverston, Cumbria and most of my family are still up there). Becky started off a little nervous around the camera, but with good banter, she soon got into it. It was a cold day and very damp under foot. But we didn’t care, we just cracked on with it. 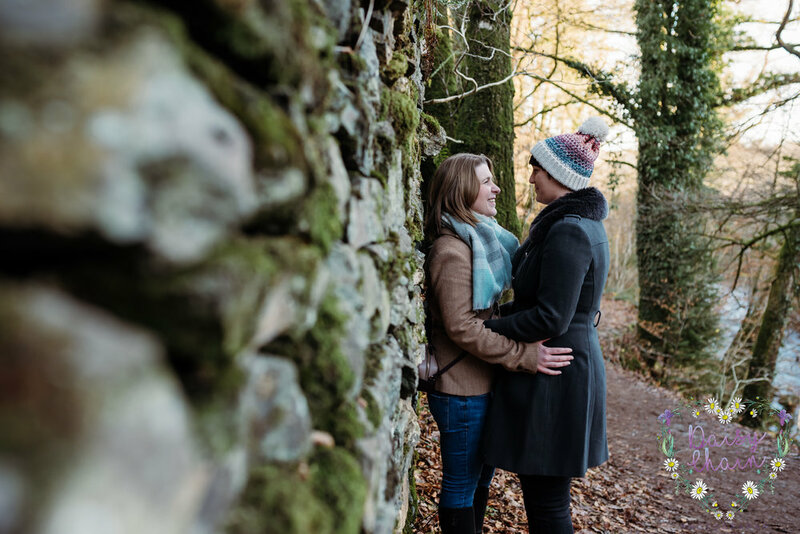 We all walked, talked and giggled whilst I shot some beautiful images of the couple. It was great to watch them interacting. You can clearly see how much they love each other. 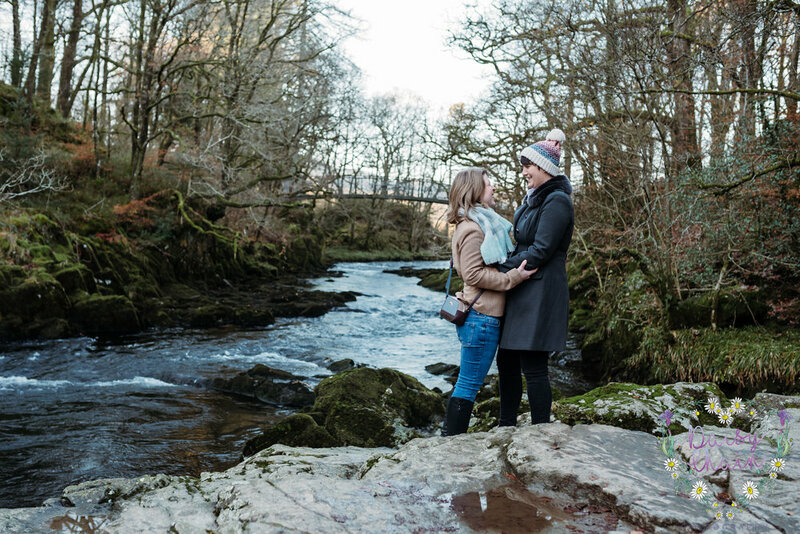 I loved hearing about further plans they had made for their up coming wedding day and I really can’t wait to join them as their wedding photographer. 1 year to go! 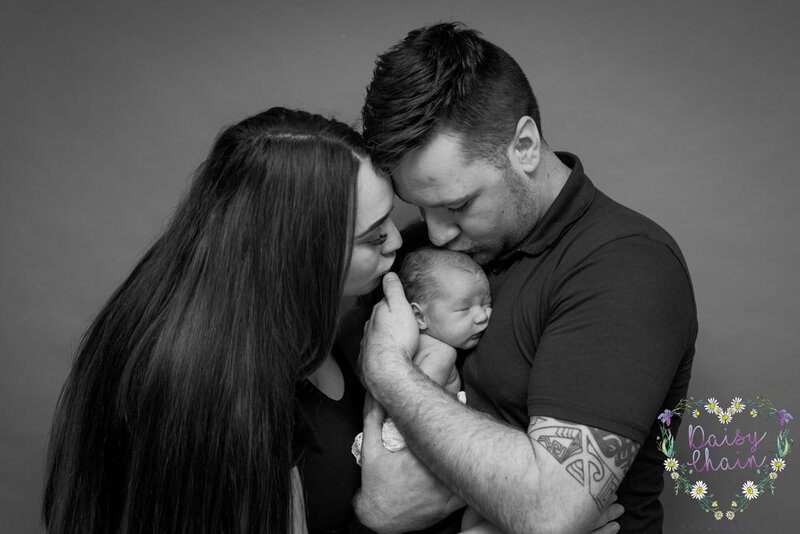 Let me start by saying, I totally love being a Lancashire based newborn, family and wedding photographer. Especially when I come across families like this! 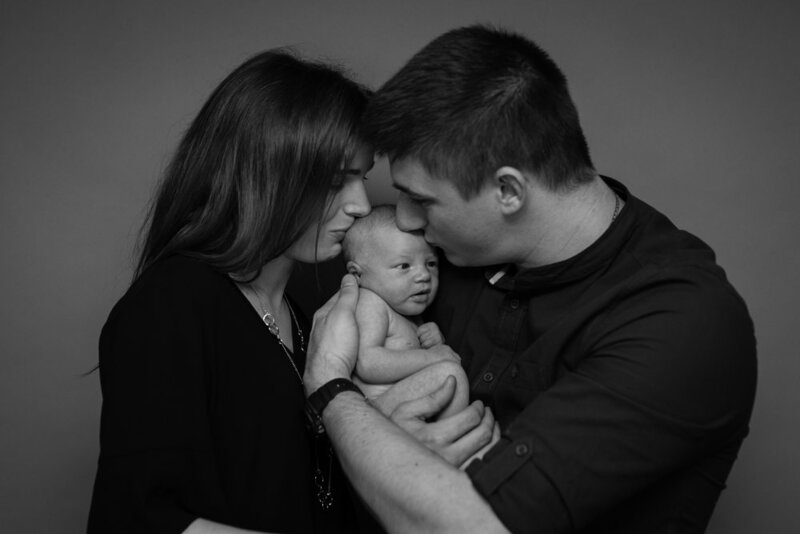 Last year, I met Isabelle and her family when they came for a newborn session. 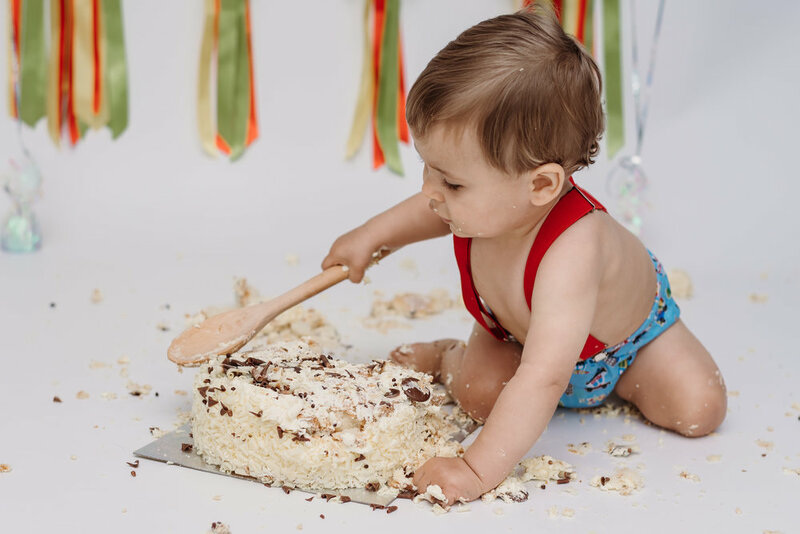 They returned last weekend for a cake smash and splash session. 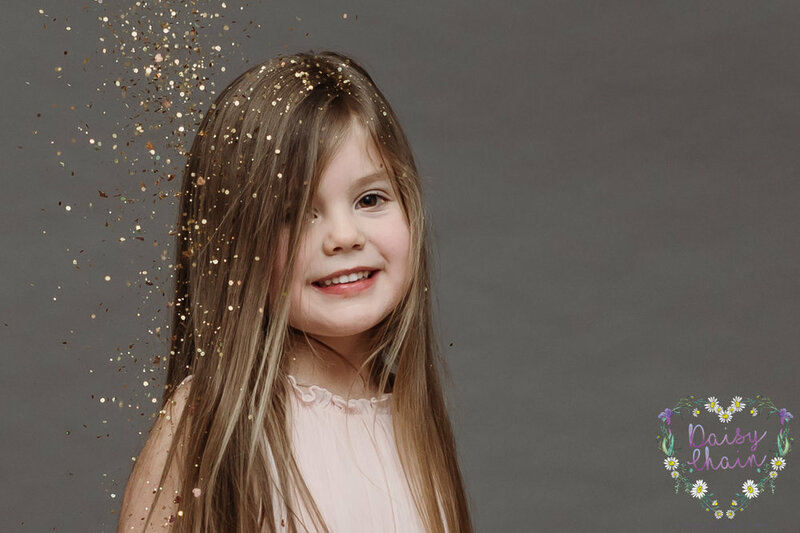 I love having children return for another shoot. It’s amazing to see how much they have grown and see their personality develop. Isabelle brought along her Mummy, Daddy and big sister. Isabelle was one of the rare children that didn’t dive straight into the cake! She was looking at us as if we were all mental (maybe we are)! Anyway, Melissa and Paul (Mummy & Daddy) hid some crisps in the back of the cake. I have used this method before and it always works. Whilst Isabelle was tucking into the crisps, her big sister, Olivia was nibbling on the icing. In fairness, I don’t blame her. I’d have done the same if I could have got away with it! 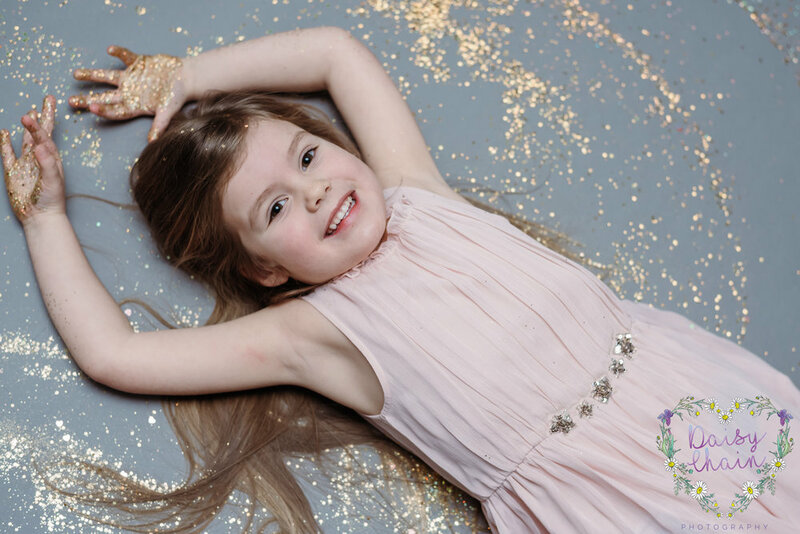 Isabelle kept playing peekaboo with us all throughout the shoot. She had me in stitches. Such a cutie! 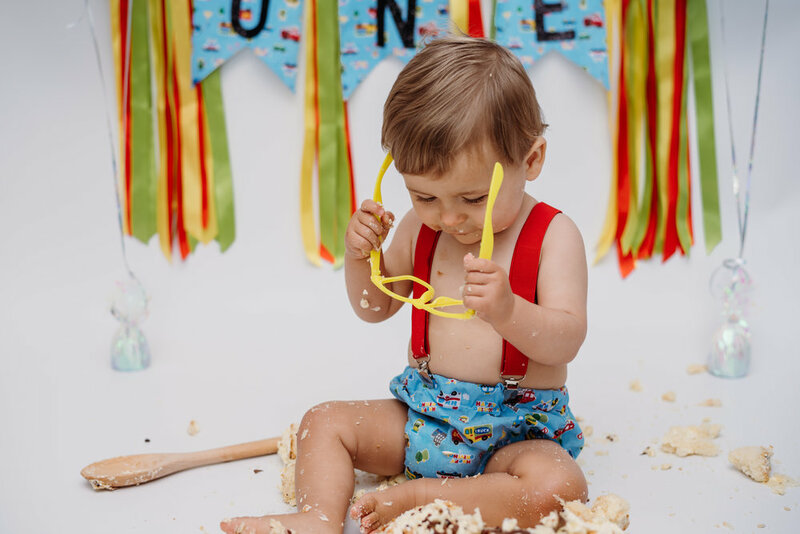 It was now time for the splash part of the cake smash session. 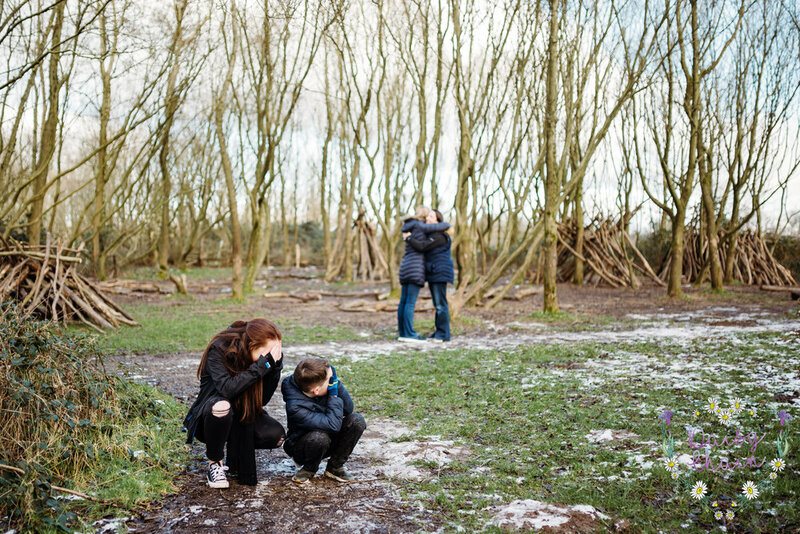 I’d been saying all the way through the shoot how this is always the bit that children enjoyed the most. Isabelle had clearly been listening in and wanted to prove me wrong. She didn’t want to get in the tub. Even rubber ducks and bubbles couldn’t persuade her. It didn’t matter. Having children of my own and working with them for a few years has taught me that all children are different. 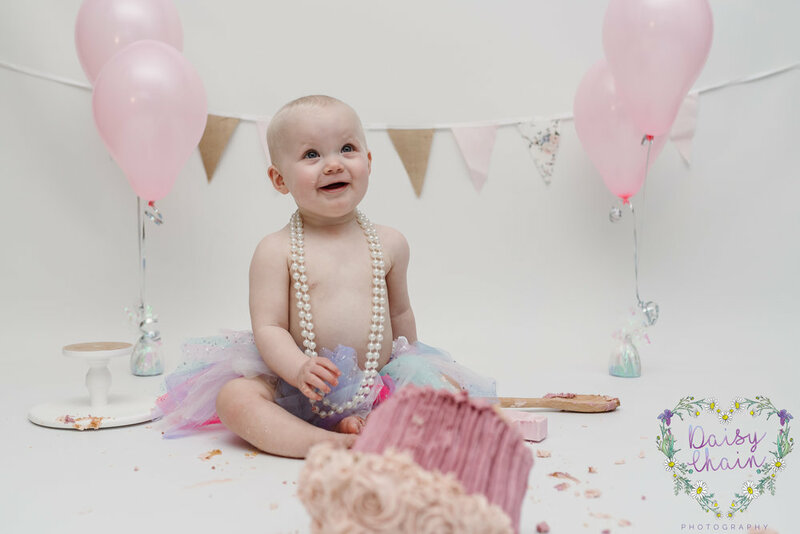 So, we put a different tutu on her and gave her a pearl necklace to play with. She loved being a big girl and taking it on and off. This family is truly awesome and I can’t wait to see them again in the future. 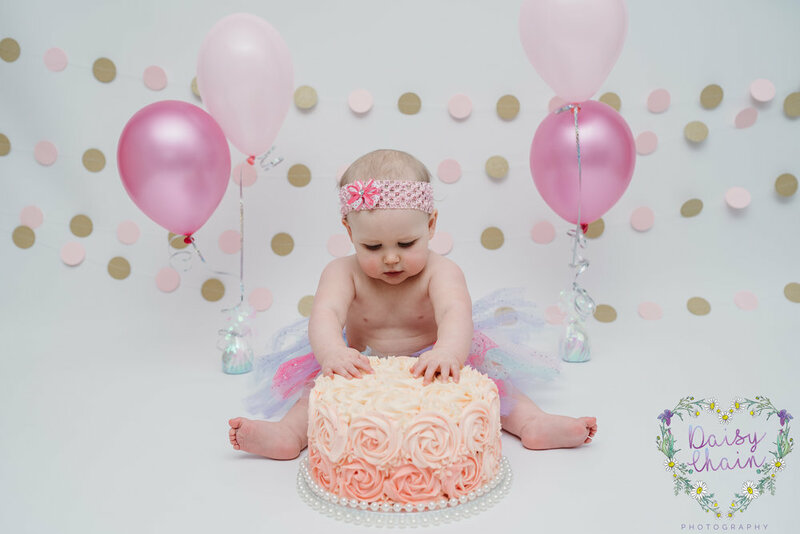 I have been lucky enough to follow Riley’s first year of life. Her parents booked my ‘watch me grow’ package before Riley was born. 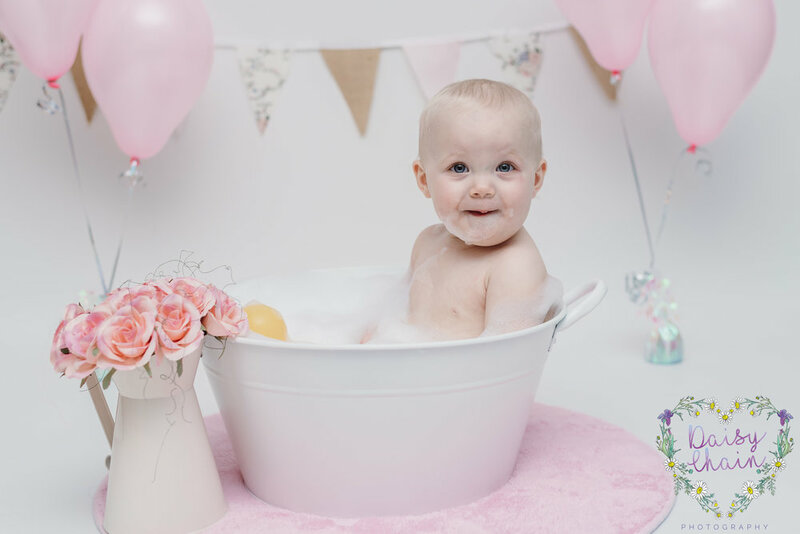 That meant they had a newborn session, a sitter session when she was around 6 months and a smash & splash session for her first birthday. Their car must know its way from Clitheroe to my place by now. Anyway, earlier this week, the big day arrived. It was Riley’s first birthday! 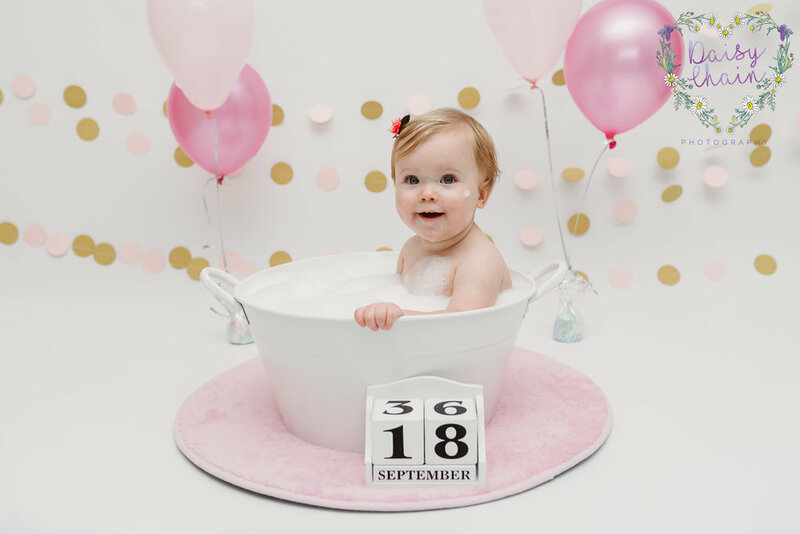 Her first year has gone so quickly. 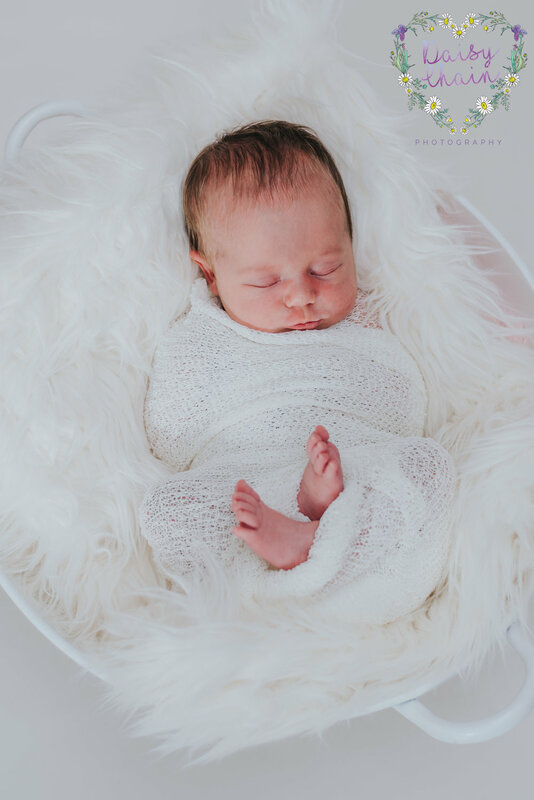 It feels like only a couple of months ago I was doing her newborn shoot! 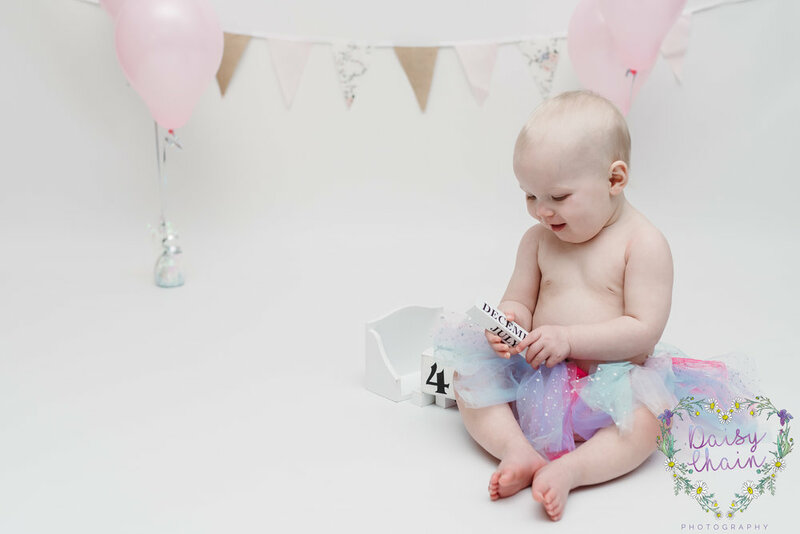 I had bought a new tutu and I couldn’t wait to test it out on her. 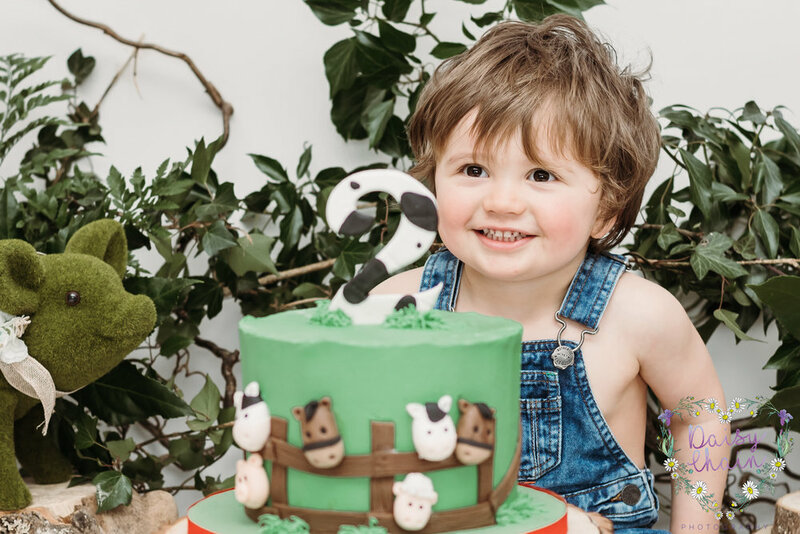 Her parents had brought along a unicorn cake. It matched my theme perfectly. 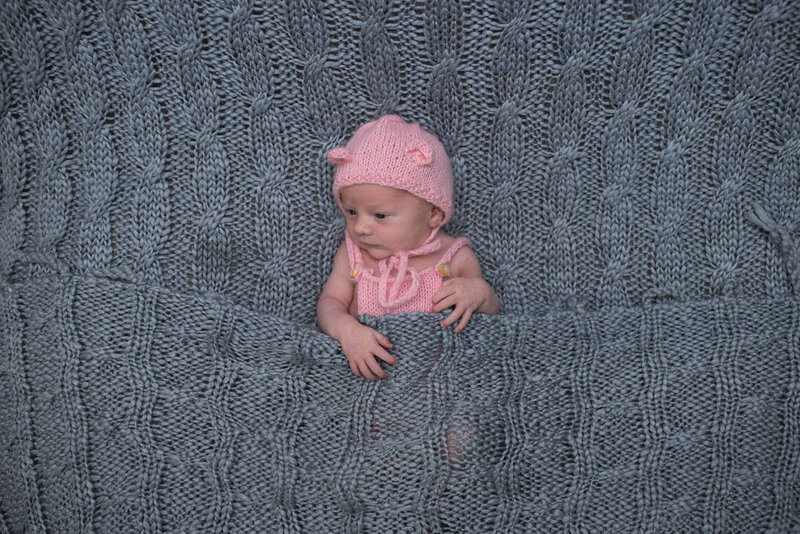 For the first time, Riley was a bit dubious about her photo shoot. She was looking at us like we were bonkers when we were telling her to bash the cake! Her Mummy got involved and showed her what need to be done. Seconds later, she was loving it. That cake went everywhere! Once I knew I had got the shots I needed, I went to take the cake away. Riley looked gutted that I was taking it from her. 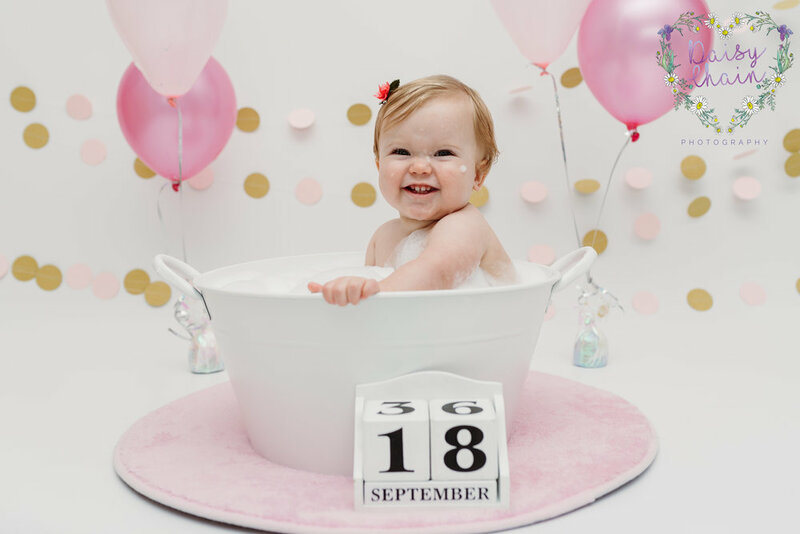 Her smile soon came back when she spotted my little tub full of bubble bath. She was especially pleased to see my family of rubber ducks. 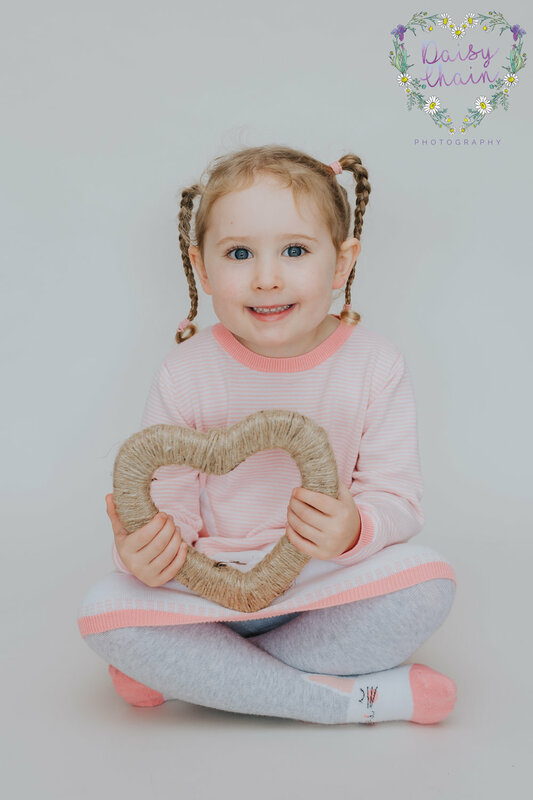 Riley has been amazing to work with each of her sessions. She is such a lovely little girl. I hope to see you again in the future. What a morning; what a lovely morning! 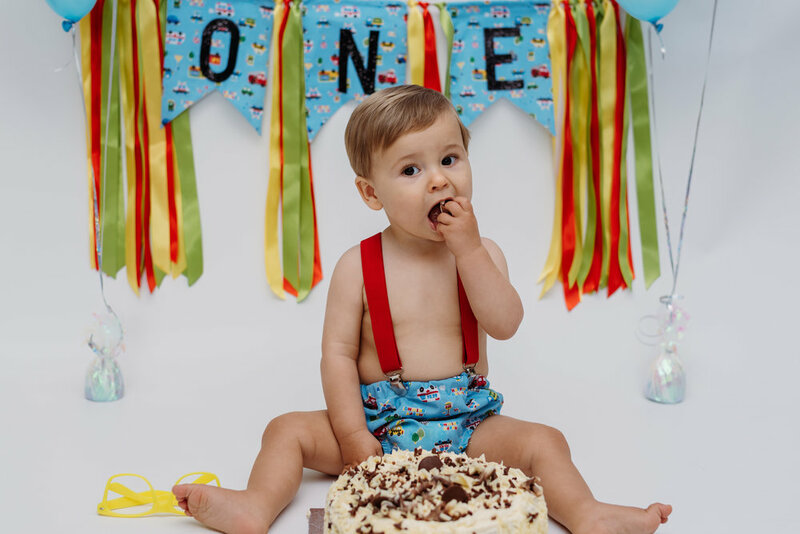 Ted came to see me on his 1st birthday for a cake smash and splash session. 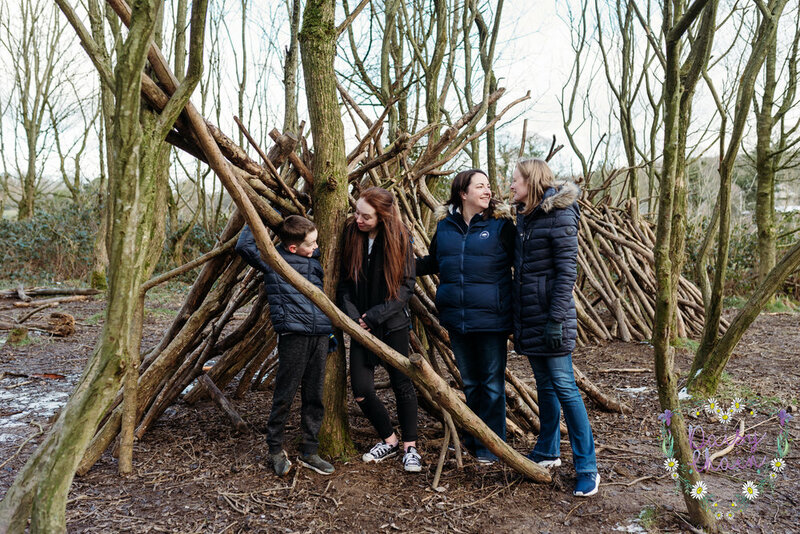 His family had come from Lytham St Annes to my studio setup in Langho, Lancashire. Ted arrived with a bit of a frown on his face. I thought he was going to make me work hard for smiles. I was wrong! Literally a minute or so in to his session, his smile came out. I started by taking some photographs of him whilst he was clean. I used a little bed with a faux fur rug on it for him to sit on. 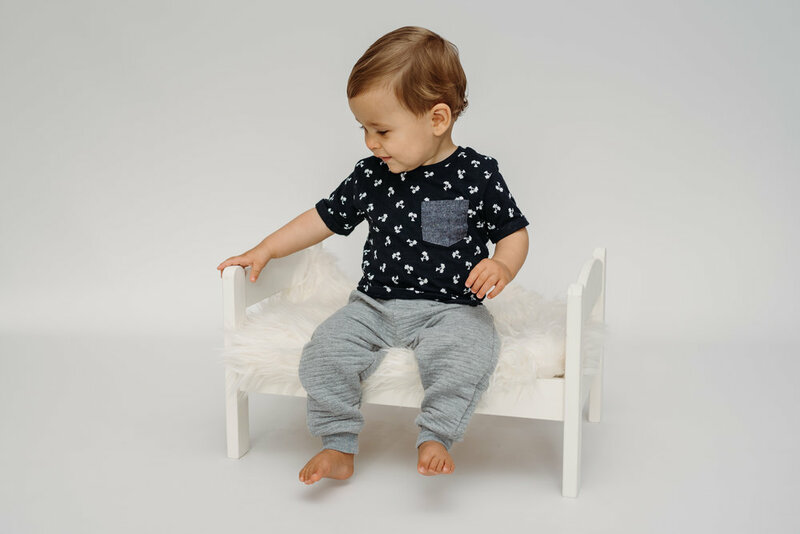 I often use this bed in newborn sessions too. It is nice for parents to be able to compare the size of their baby on it as a newborn and as a 1 year old. It was now time to get messy! 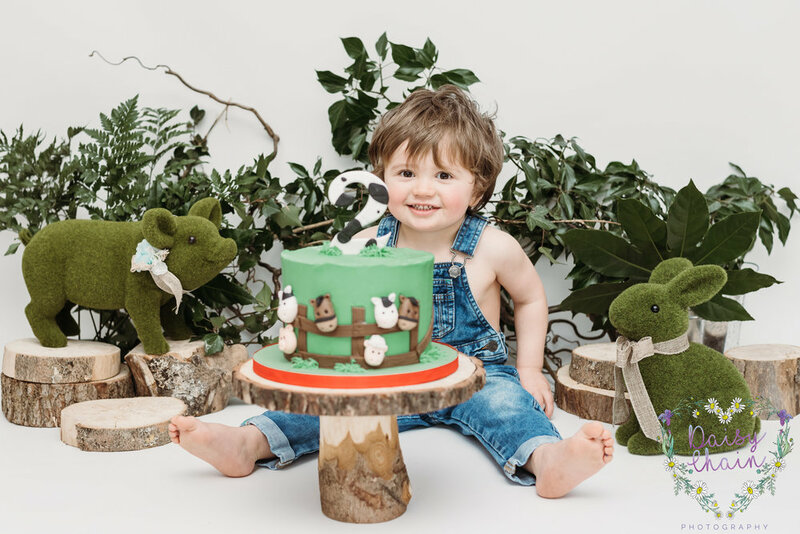 Ted’s parents had brought their own cake. It was a bit too big to go on my lovely little cake stand. Ted wasn’t bothered about that though. He was keen to get stuck in. A little too keen. He was trying to get at the cake before I’d even got it out of the box properly! I do love an eager child. I dressed him in a blue nappy cover that has little police cars on. It was held up by red braces. I didn’t use the matching hat today, but I did use matching bunting. Ted loved my yellow novelty glasses. Cake was now everywhere, including all over my feet. I hadn’t stood in any of it, Ted had massaged some into them. I wasn’t bothered, it was lovely to see him enjoying himself so much. It was now time for a clean down in my little tub. 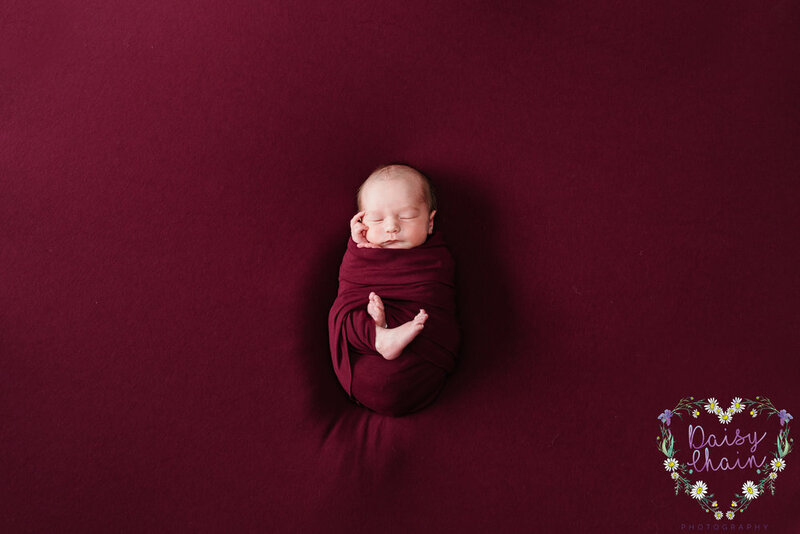 This is another prop that I often use in my newborn sessions. Again, great to compare your little newborn to your massive 1 year old. At first, Ted wasn’t convinced. So I gave him some rubber ducks. His eyes lit up and he was well away. This is where the his biggest smiles came out. He was loving splashing around in the tub. Ted really nailed his smash and splash session. He settled in to it straight away and knew exactly what to do. Below are some of my favourite images from this session, enjoy! If you’d like to book a smash and splash session, or any of my other sessions, please drop me a message or give me a call. A couple of months ago, I ran an offer on Facebook. It was when the World Cup was on. England were doing well and were in the quarter final. 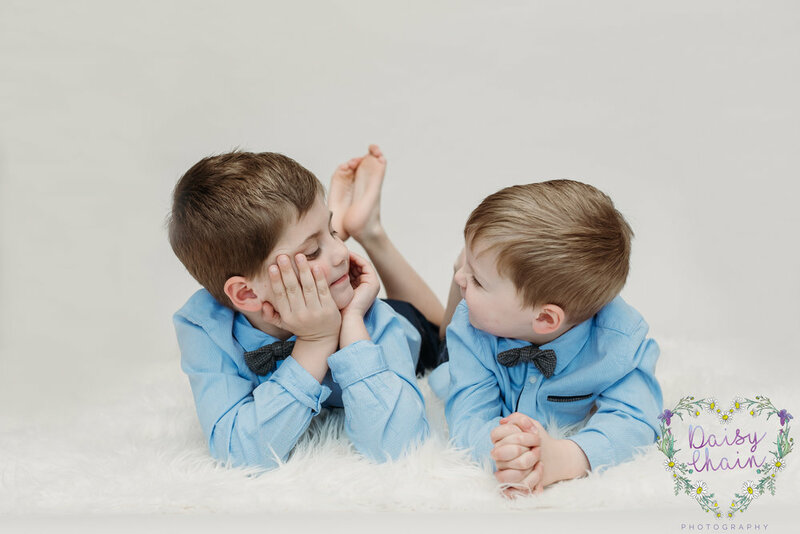 So I offered all families that booked that month 25% off their photo shoot. 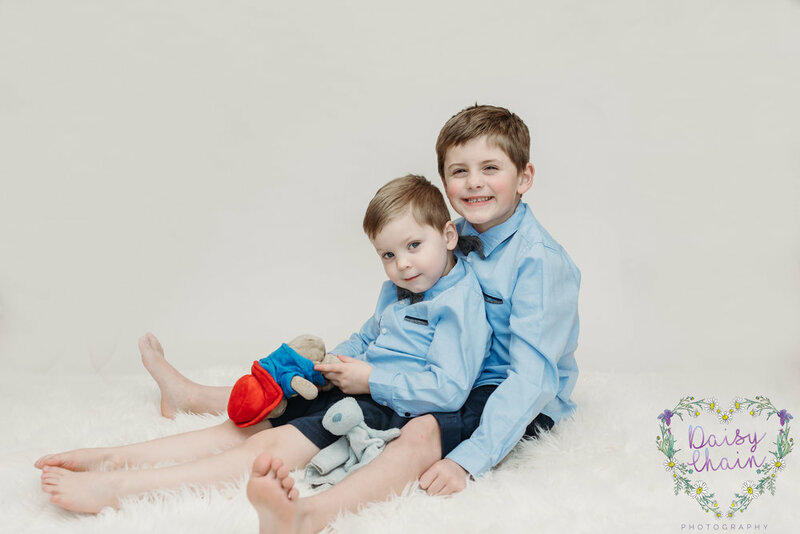 I also said I would pick one lucky family to win a free shoot. That promotion went really well. I got various bookings from it and met lots of fantastic new people. 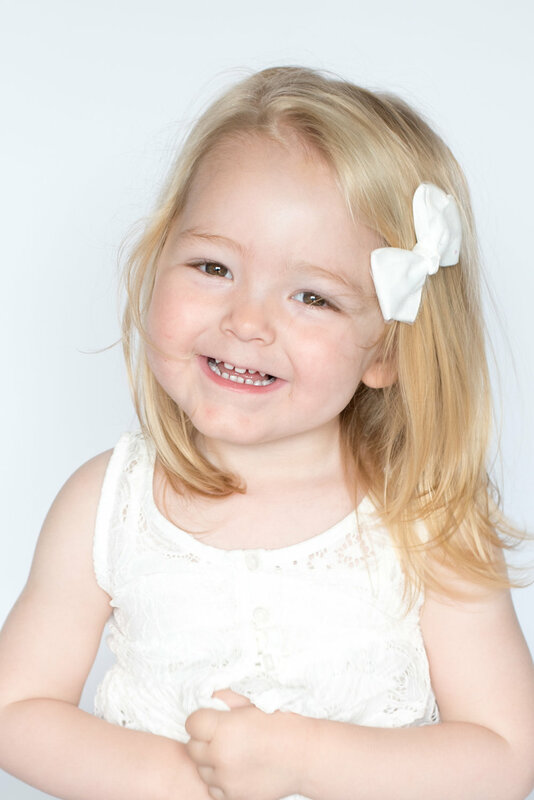 It went really well for Adele who was my chosen winner for the free photo shoot! Adele and I made 3 bookings before we actually met. The weather was so bad, considering we were in August at the time. Anyway, on the morning of the third booking, guess what? It was raining, again! We decided to go for it anyway and hope that the rain would pass. So I met Adele and her beautiful family at Towneley Hall in Burnley. It is such a fantastic place with loads of paths to explore with kiddies. We were wrong about the rain passing, but it was only drizzling. We went for it. I had literally taken about 3 photographs before the heavens opened. Again, we kidded ourselves and said it wouldn't last. It did! We ducked in and out of various shelters to avoid the worst of it, but it wasn't for stopping. We carried on regardless. Do you know what, I am so glad we did. Here is what Adele had to say about her experience. 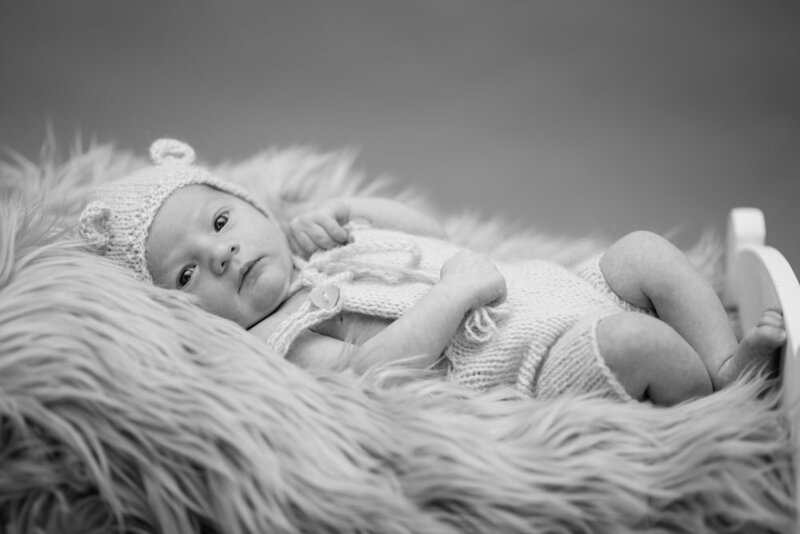 Ribble Valley & Lancashire Wedding and Newborn Photographer. 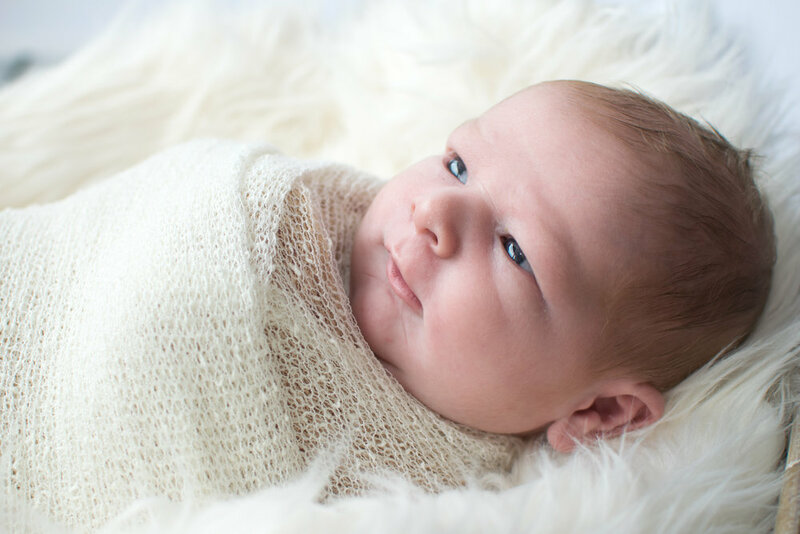 Earlier this year, I did a newborn shoot with a gorgeous baby boy called Coby. 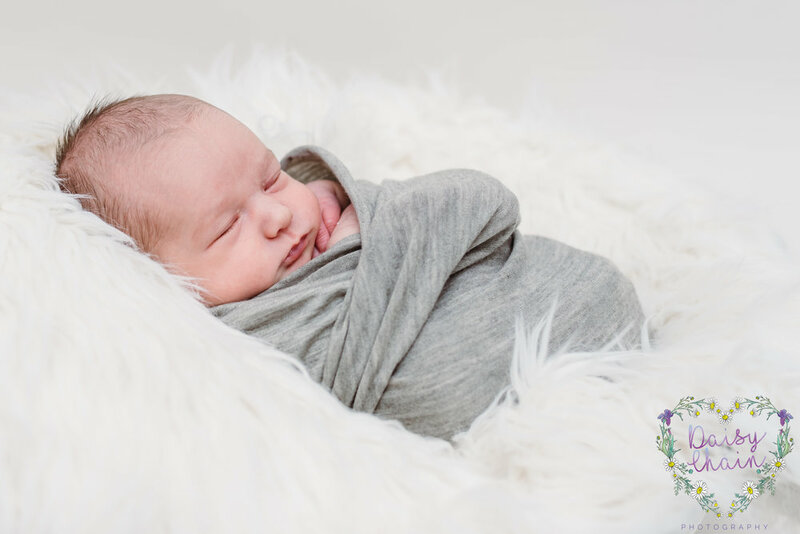 After I had shared some images from that session, Coby's Auntie messaged me to say she was pregnant and would love to book in a newborn session. Flash forwards to the end of August. I got a message to say that baby Rose had arrived! 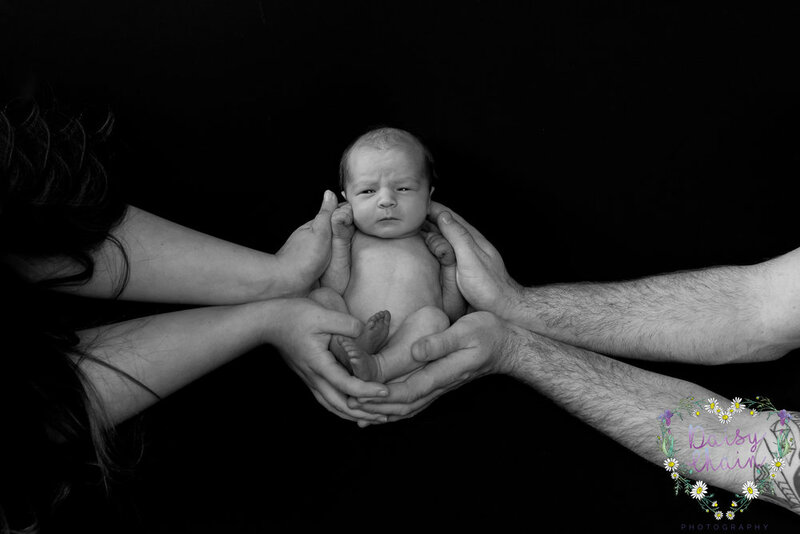 We were able to go ahead with the newborn session that we had already booked in. Quite often, these have to be changed due to baby arriving earlier or later than expected. So, Rose attended my studio style setting in Langho, near Clitheroe. She also brought her big sister, Mummy and Daddy too. She was just 9 days new at the time. Rose arrived sleeping. 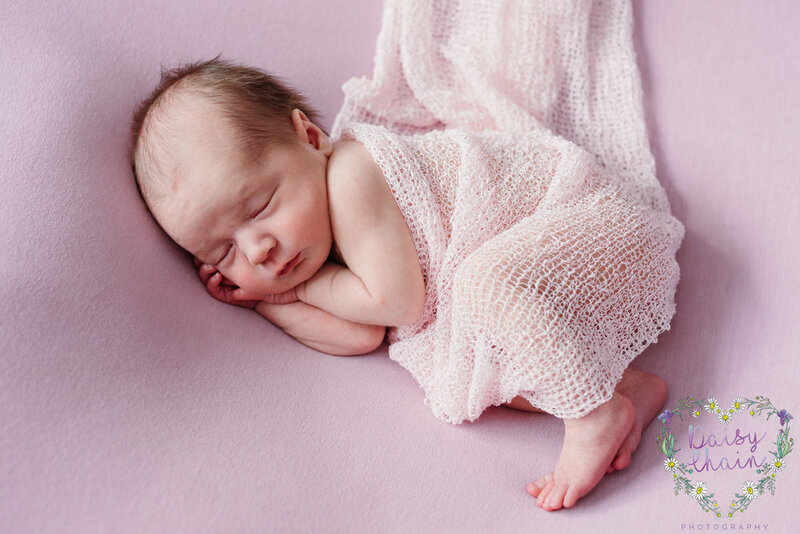 She stayed asleep practically the whole session - a newborn photographers dream! 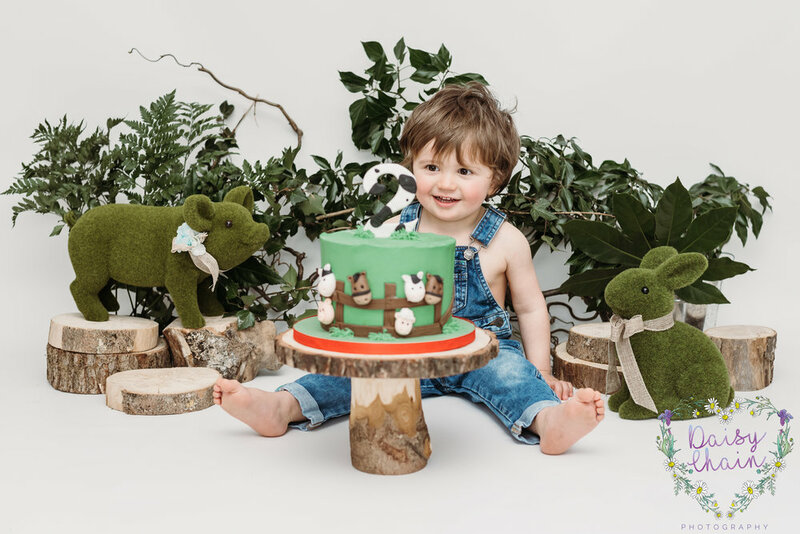 I used various props, including a mini bed, trug and my newborn beanbag. 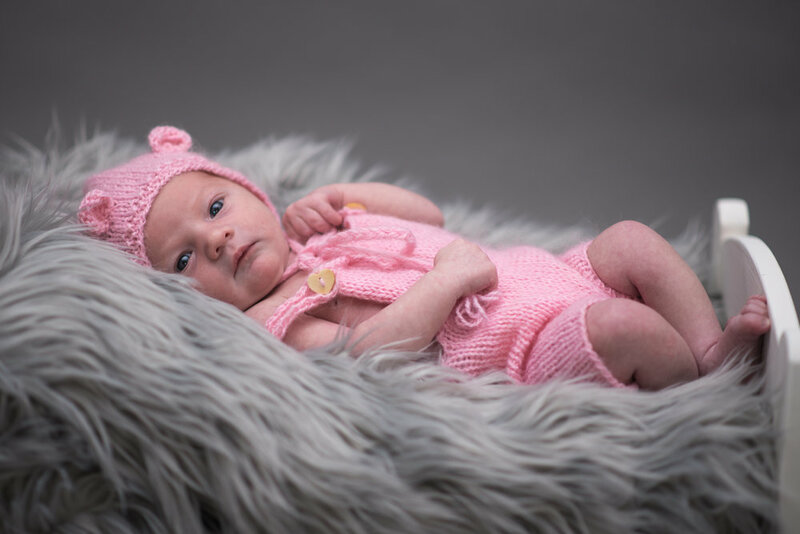 She looked totally adorable in my hand knitted pink romper suit and matching hat. She also seemed to love my faux fur rugs. Mind, they are super cosy! Rose's big sister, Emily was keen to get in on the action. She showed me some of her most amazing smiles and also showed me what a fantastic big sister she was. She was really helping her parents care for her new baby sister. It was so lovely to see. 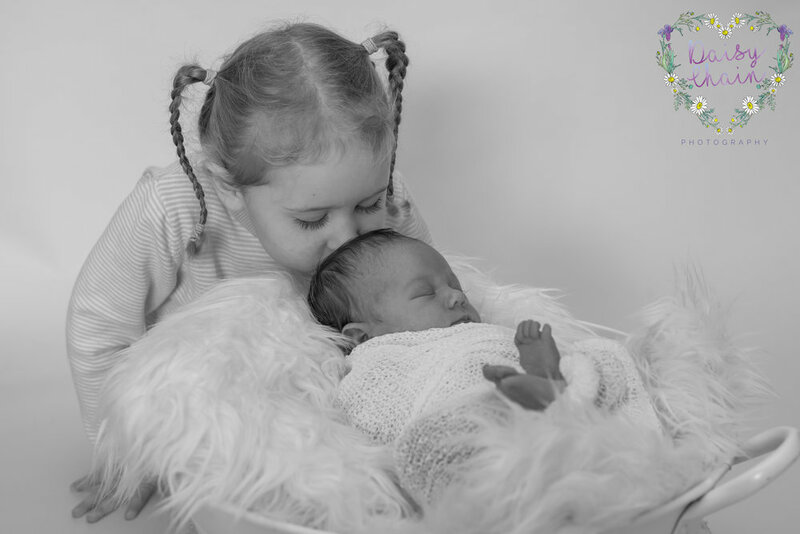 If you are pregnant and would like to book a newborn session / newborn and sibling session, please get in touch. They can be booked after your 20 week scan and just require a £30 deposit. Here are some of my favourite images from the session. 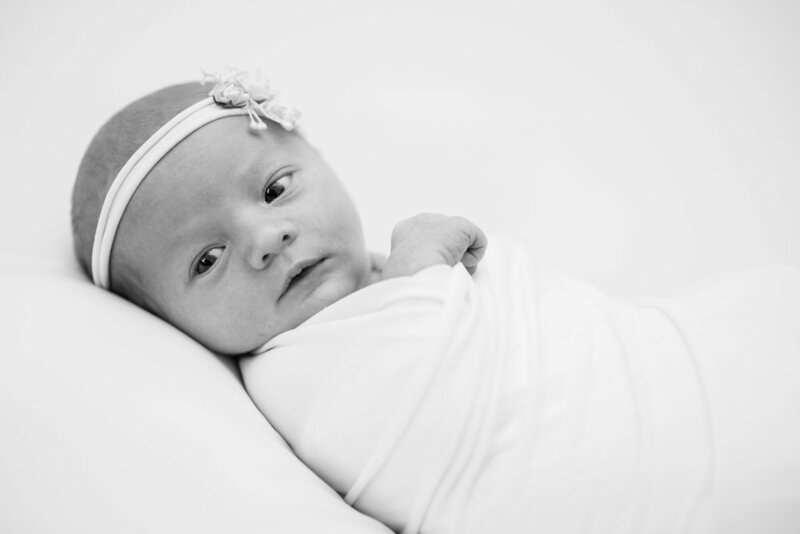 Last year, Riley and her family came for a newborn session. If you follow my work, you may remember her. She was one of my favourite sessions and I used one of her images to promote my work, a lot! I have even included it in this post as a recap. 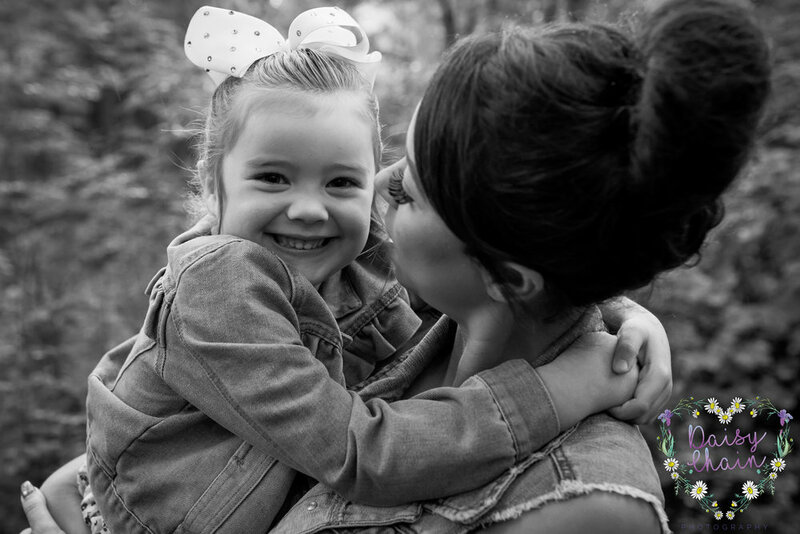 I was really pleased when Riley's Mummy contacted me to book in her sitter session. 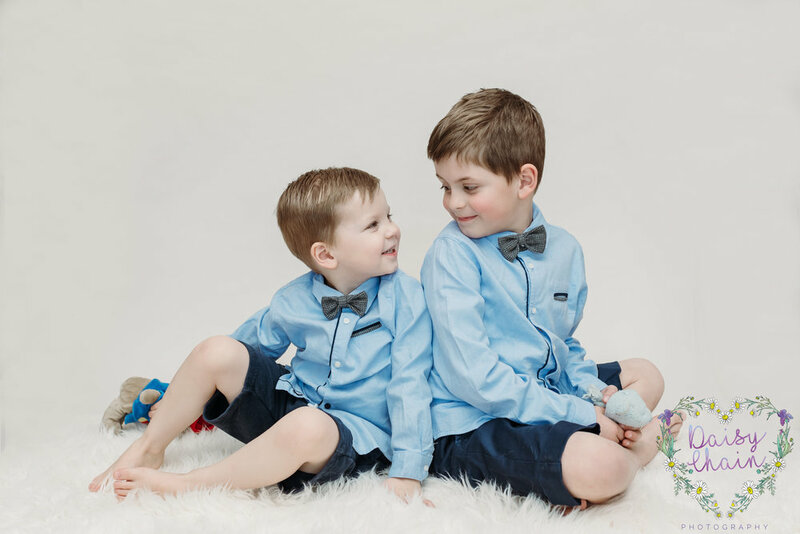 I knew it was coming as we had already discussed it at their newborn shoot and we had kept in contact in between. I couldn't wait to see how much she had grown (and get another cuddle!). The day of the shoot had arrived. Riley's Mummy sent me a message to say they were setting off from their home in Clitheroe to my home studio in Langho. They pre warned me that Riley wasn't in the best of moods that morning and that I might have my work cut out. I wasn't bothered. As a Mother of two and Step Mother of two others, I know hard work children can be. Anyway, they arrived. Riley was absolutely fine. In fact, she was better than fine; she was awesome! Her balance was perfect, she was happy to pose and was smiling away the whole time. She looked so beautiful, wearing one of my little outfits. I had chosen her a gorgeous cream romper suit. We had such a lovely session and I did get my cuddles; lots of them! I can't wait to see her in a few months time for her smash and splash session! Below are a selection of my favourite images from her sitter session. 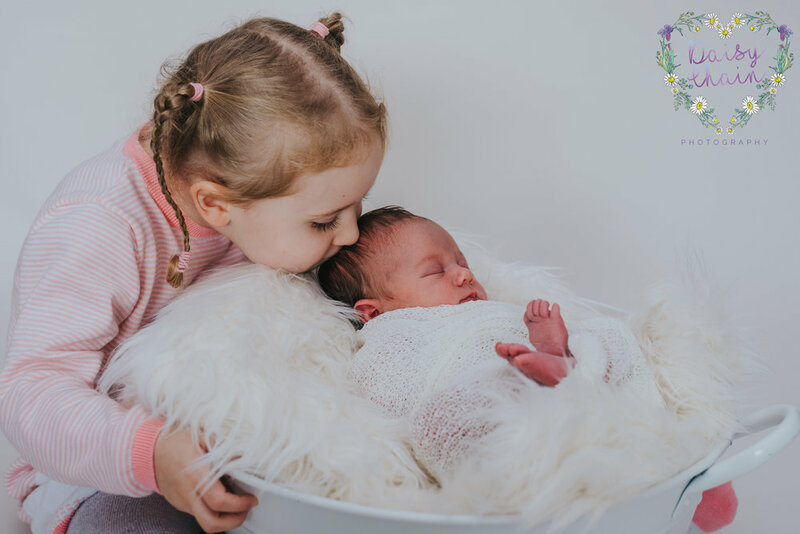 As you may know, as well as being a Ribble Valley based wedding photographer, I am also a newborn and family photographer. 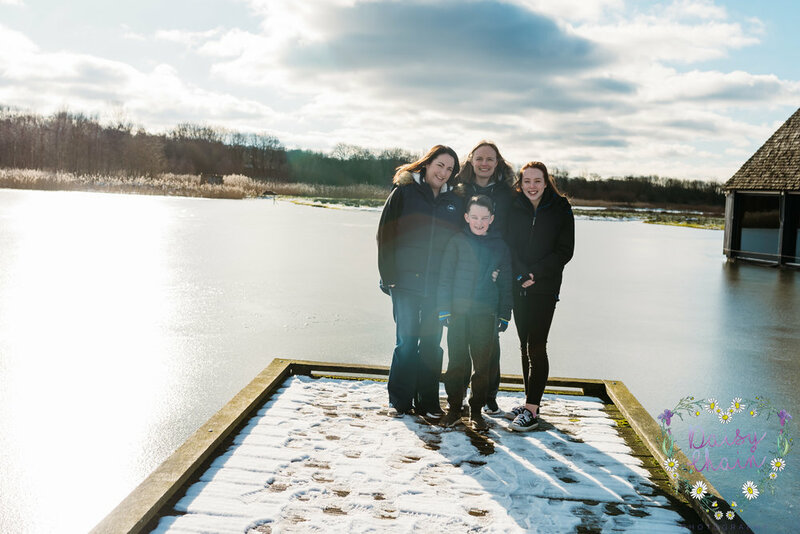 Last Christmas, I met Jesse and his lovely family when they came for a Christmas photo shoot. 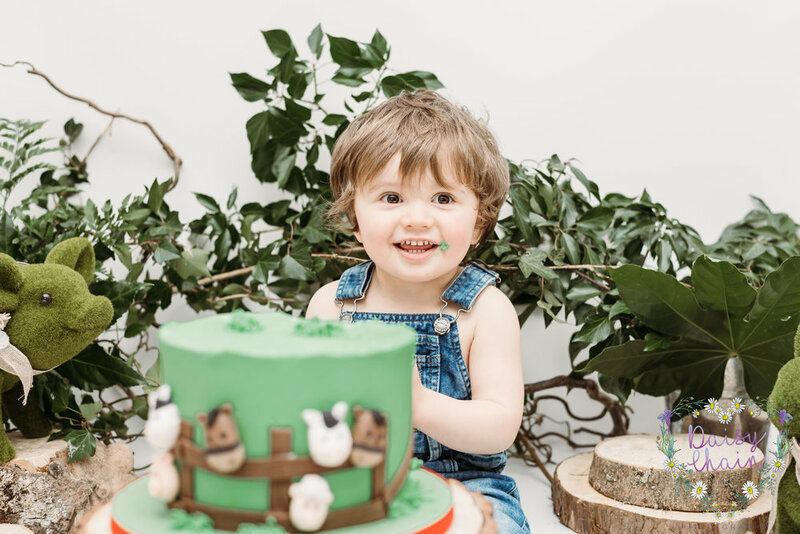 I was delighted when they made contact and asked if I would I'd do a cake smash session to celebrate Jesse turning one. I ordered a fantastic giant cupcake from Ebella who are based in Bashall Barn, near Clitheroe. 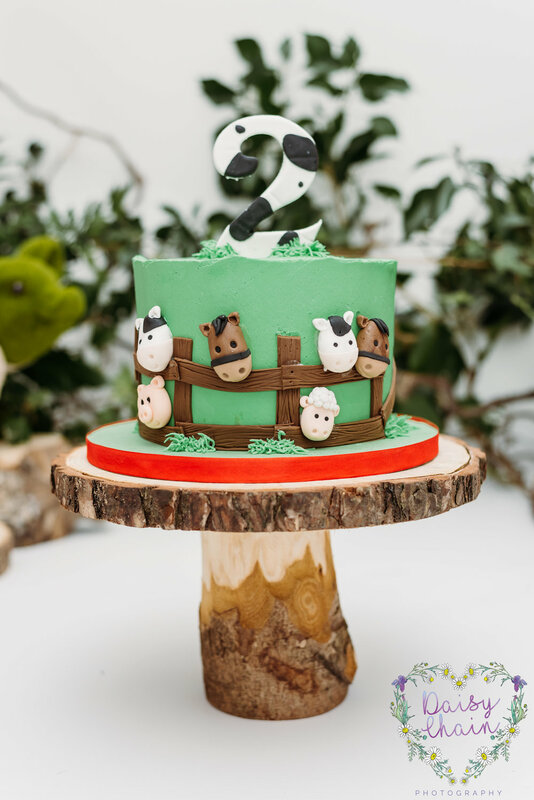 I have worked with the lovely ladies from there before and knew that it would be a fabulous cake (they didn't disappoint!). I also ordered some blue helium balloons from Party People in Clitheroe. I knew they'd go perfectly with my new blue bunting and accessories. 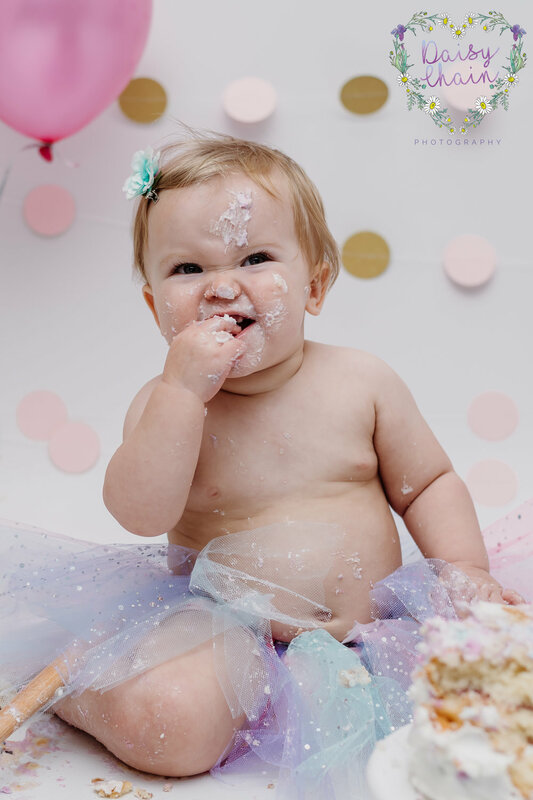 The day of the cake smash arrived. I had set up on my large vinyl backdrop as I knew that things were about to get messy! Jesse and his family arrived. Wow, he had massively grown since I last saw him. 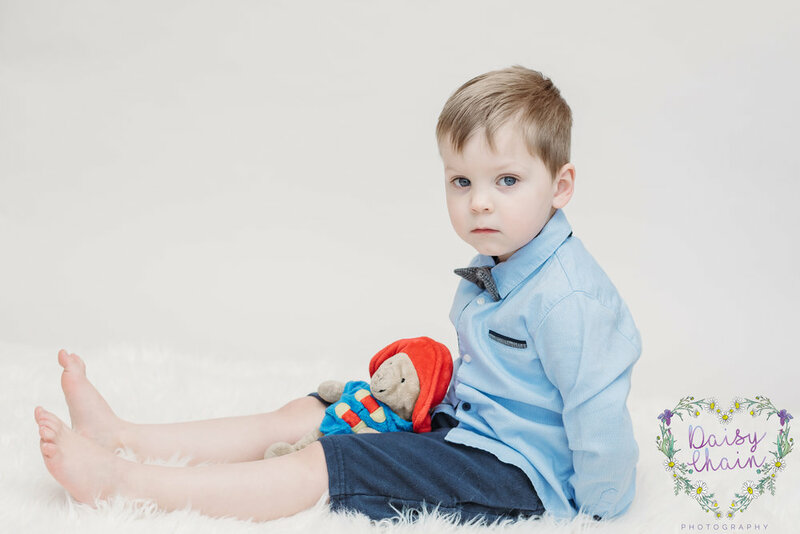 His Mummy and Daddy had bought him a lovely little Peter Rabbit outfit. Unfortunately, he wasn't overly keen on wearing it. So I brought the cake out to distract him. Turns out he wasn't up for that either and pushed it over straight away! Like they say, never work with kids or animals! Luckily, I love a challenge and we managed to get him interested for the shots I wanted. Next, I brought out my little tub that I use for a babies to have a bath in. 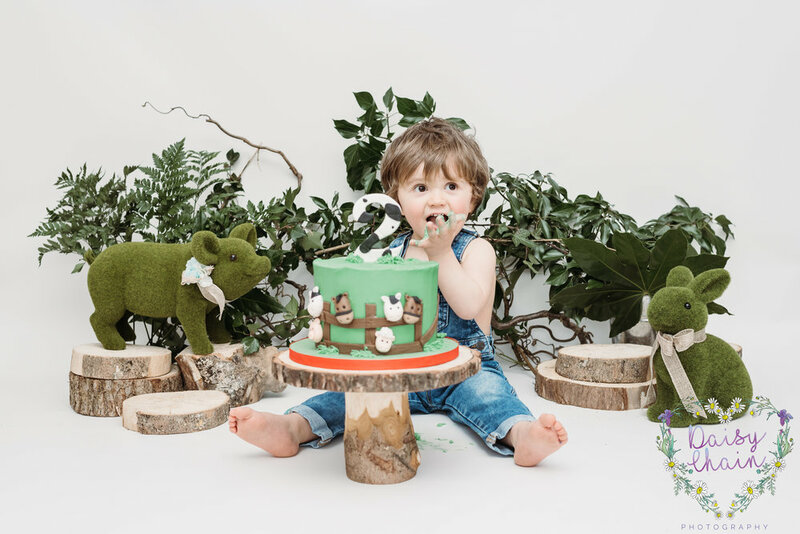 I like to give a little more with my cake smash sessions and make them in to a smash and splash session. Well, Jesse totally loved being in that! In fact, I think he would have stayed in there all day. This is when Jesse's biggest, most beautiful smiles came out. I was so pleased to see them. 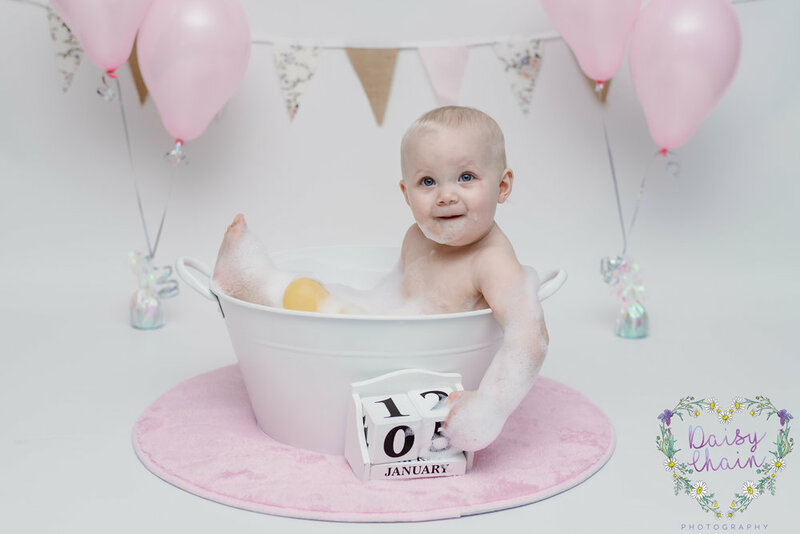 If you're about to have a special birthday in your family, why not book a smash and splash session with me. Like I say, it does get messy, but who doesn't love a bit of chaos from time to time? Especially when it's not in your own house and you don't have to clear up! 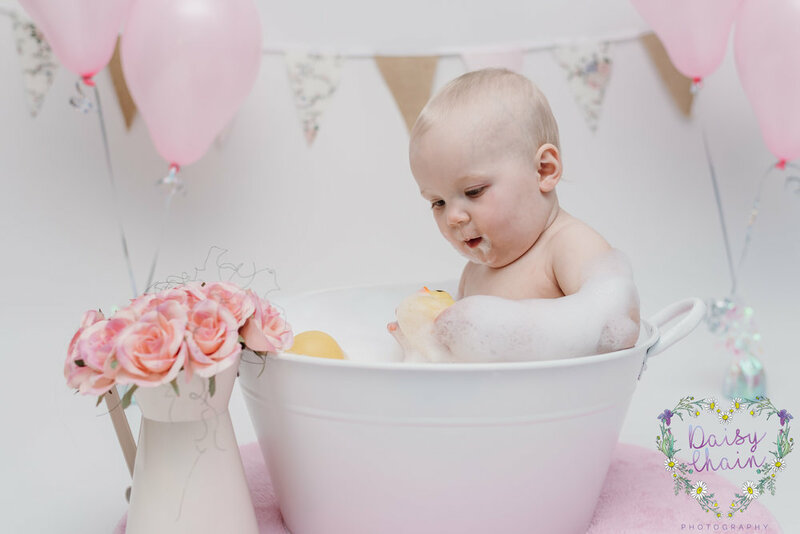 Ribble Valley and Lancashire Wedding and Newborn Photographer. Back in October 2017, I attended a wedding reception of an old work colleague and his lovely new wife. 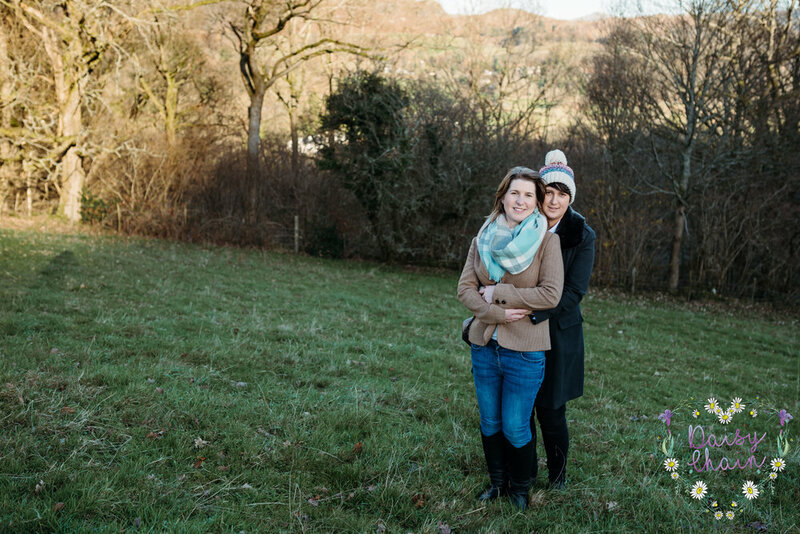 Whilst I was there, the bride asked me if I would be able to fit them in for a newborn session in the new year. So a couple of days later, we penciled in a date. The new year arrived, but no new baby! So we changed the date for the following week. I again made contact with the parents to be, but still no baby! We put the date back another week. Was it to be, third time lucky? Yes it was. I woke up to a message later that week to say that Coby had arrived. Fantastic news. So 9 days later, the date for that shoot went ahead as planned. Coby and his family came across to my house in Langho (near Clitheroe) from theirs in Burnley. Coby was unsettled at first so had another feed, then another. He was one hungry boy! He still wasn't happy and just wanted cuddles. I was more than happy to oblige! I love newborn baby cuddles. After that, Coby was ready for his shoot. What a little star he was. He totally nailed his session and kept giving me cheeky little smiles. Just look how gorgeous he is! 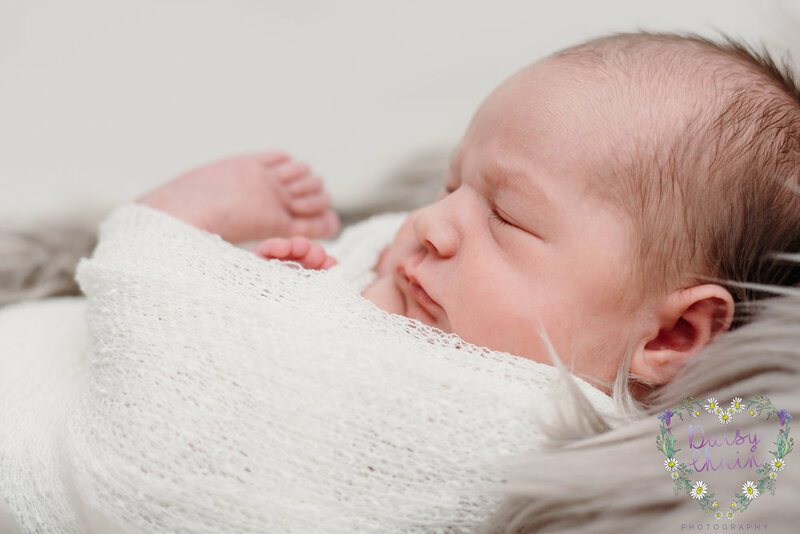 If you are pregnant and want to book a newborn session, please drop me a message. 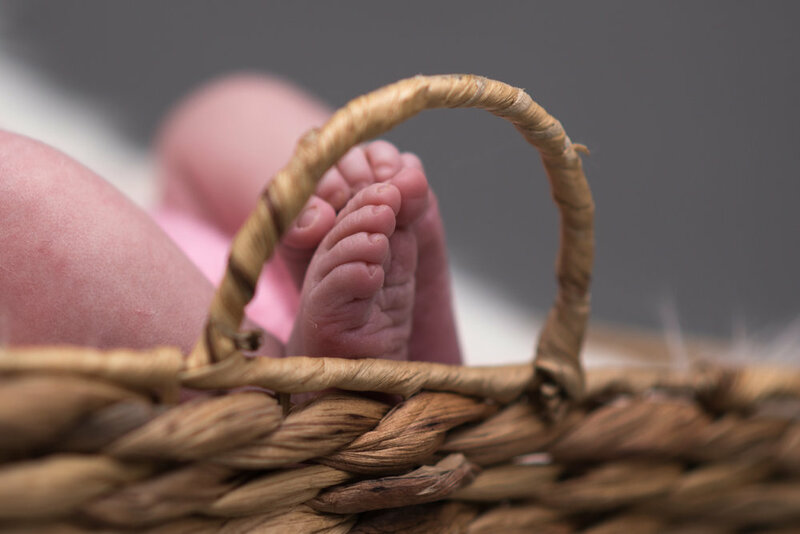 Sessions can be booked in any time after your 20 week scan. It is best to book in early to avoid disappointment. 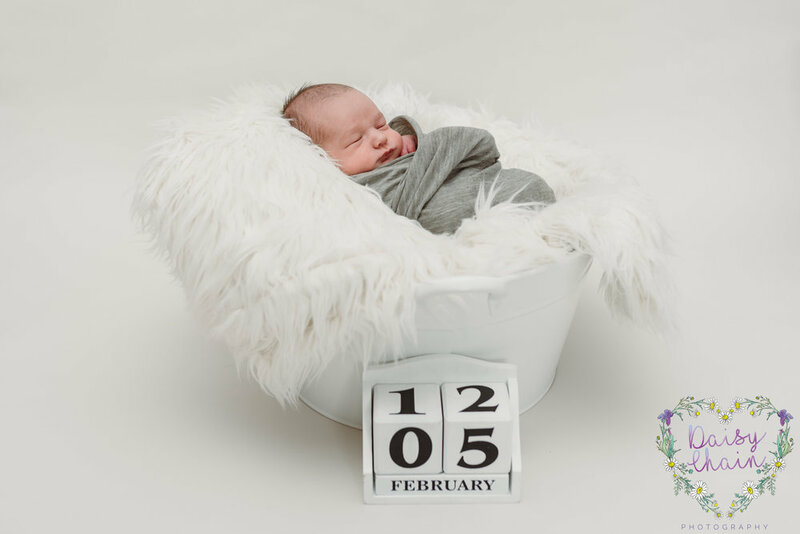 I only book in a couple of newborn sessions per month so I can be a bit flexible with changing the date, like I did with Coby and his family. 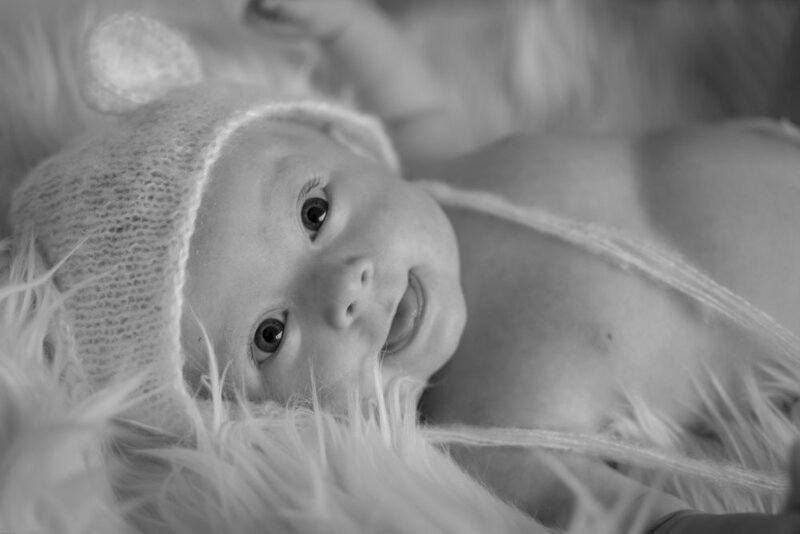 Back in October, The lovely Rachel had seen an image I shared on Facebook from a newborn shoot I had just done. She told me that she was pregnant with a little girl and was due in January. So I booked her in and we agreed to get in contact nearer the time to see if that session still suited. We we both happy for that date, but it depended when their little girl decided to arrive. Anyway, Rachel messaged to advise me that their little girl had arrived 2 days early. Our appointment fitted perfectly. 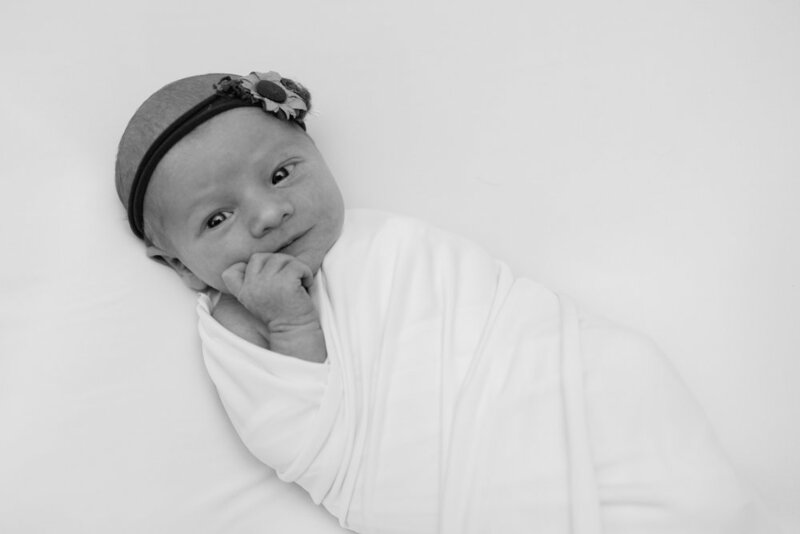 So earlier this week, the totally gorgeous Aria arrived for her newborn session. I am based in Langho in the Ribble Valley. They came from Great Harwood, so it wasn't far at all. Aria's parents were really concerned as she really hates getting changed and especially hates being in her birthday suit. They pre warned me that she would scream the whole time. She didn't. 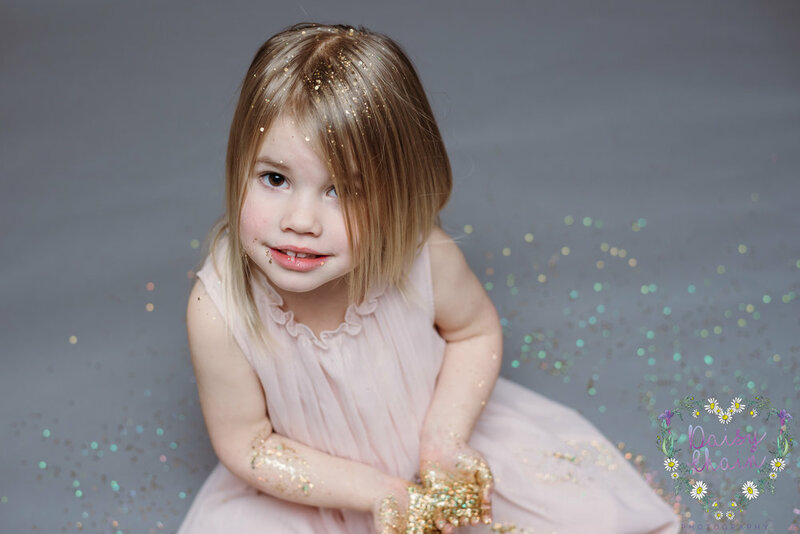 She was a total star and rocked her session. She was unsettled a couple of times, but that was nothing that a bit of milk couldn't cure. 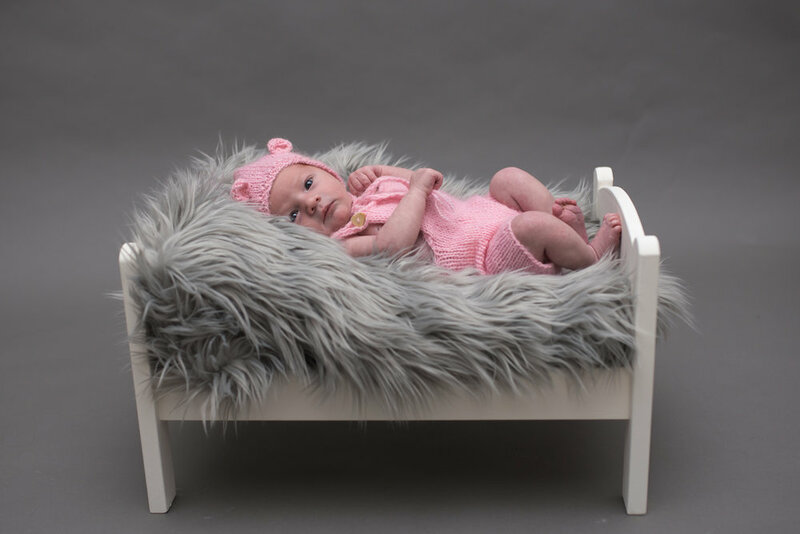 I started Aria off with my lovely selection of newborn props and faux furs. She loved that part. She made herself really comfy and slept the whole time! Once I was happy with those images, I moved her on to my newborn beanbag. She was wide awake by now and decided she didn't really want to be wrapped up or wear my pretty headbands, so we free styled it. 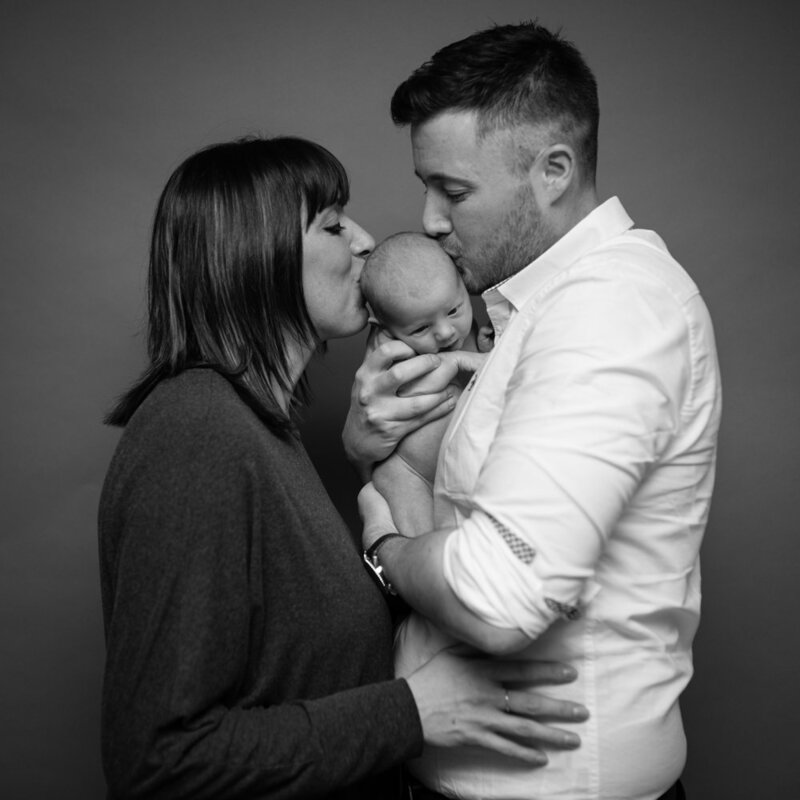 After that, it was time for a couple of smoochy shots of her with her Mummy and Daddy. Perfect. Rachel has just viewed her gallery and totally loves it. 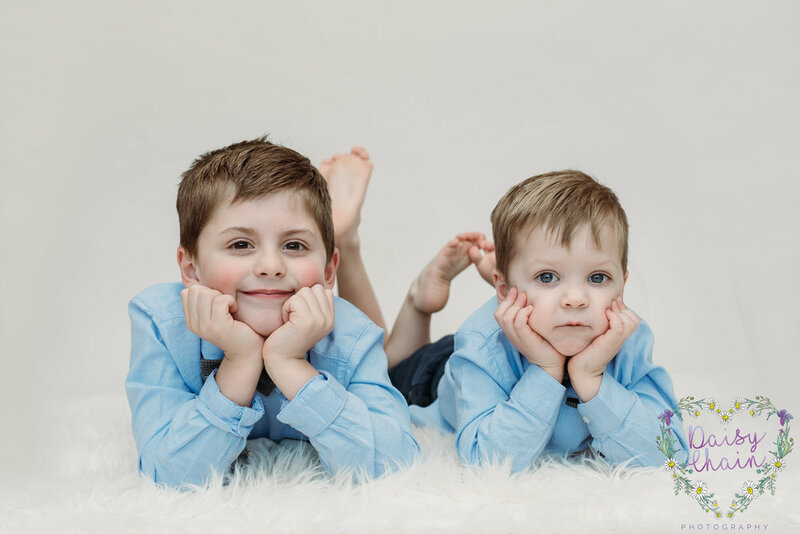 I love it when a happy client messages me straight away to say they are over the moon with their images. I look forward to seeing Rachel, Martin and Aria in the future. 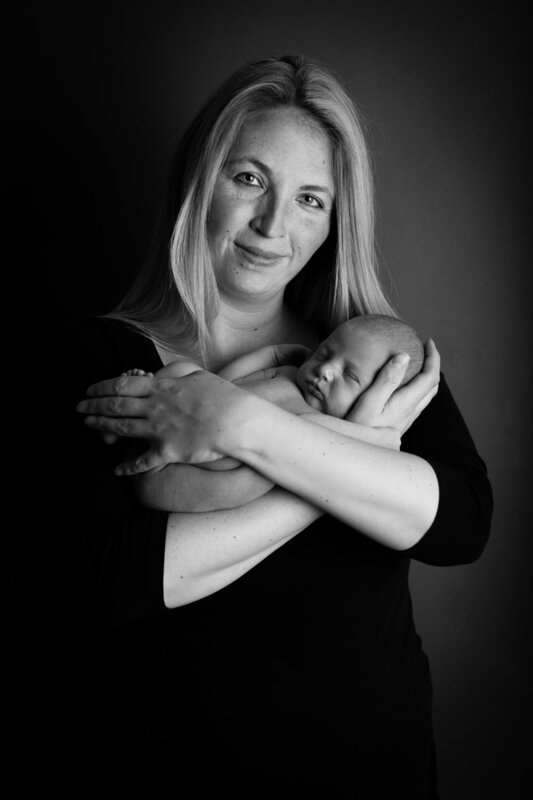 If like Rachel you are pregnant and want to get your newborn session booked in, please drop me a message. If you have been following my work, you might recognise Annabelle. 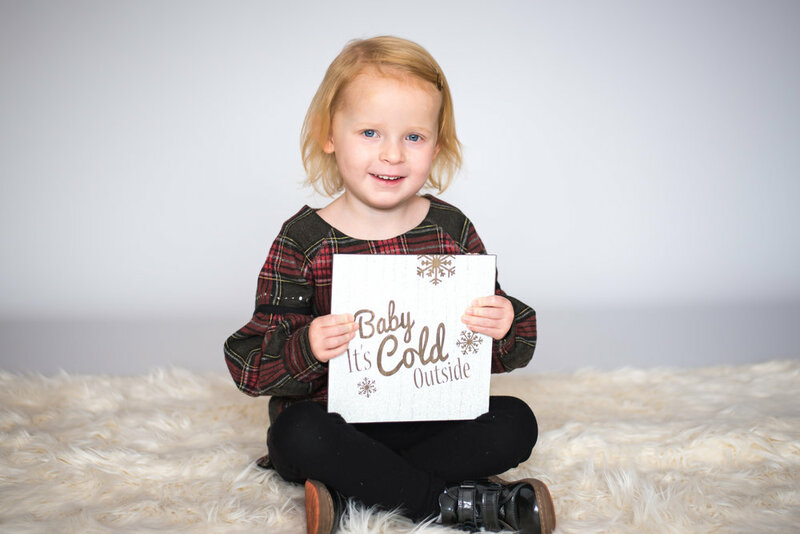 She came to for a photo shoot approximately 6 months ago with her cousin, Jaxon. 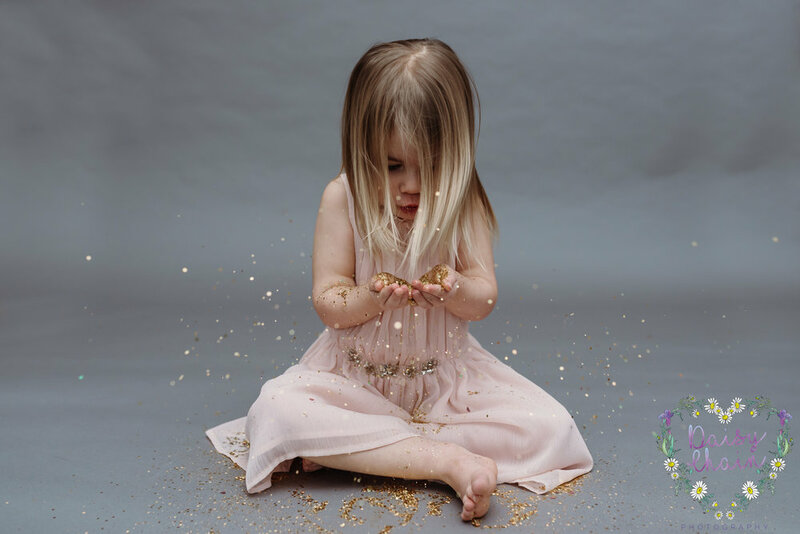 On that shoot, Annabelle announced she was going to be a big sister! 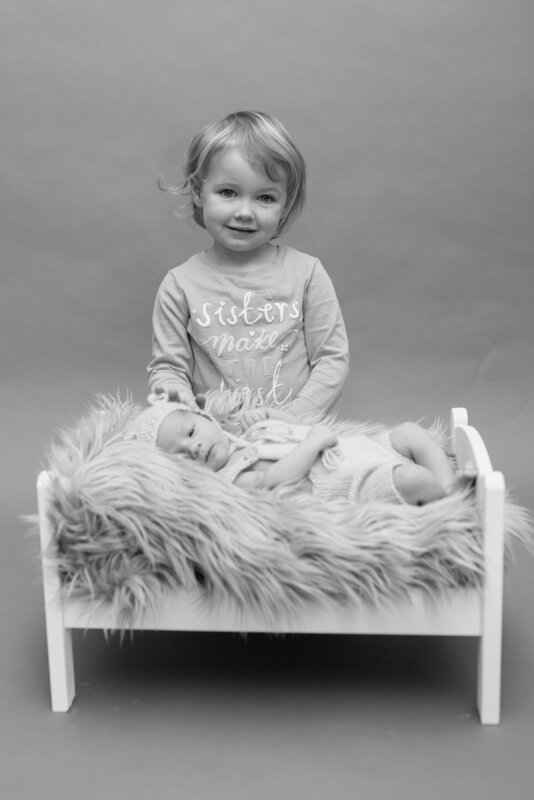 So, this week, she returned with her brand new baby sister, Harper for a newborn and sibling shoot. Annabelle found some of my daughters toys to amuse herself with whilst Harper took centre stage. I started her off in my favourite hand knitted outfit and used various baskets, bowls and faux furs. She was a little unsettled at first, but a quick fill up of milk and she was good to go. From here, she totally rocked her newborn session. She wasn't for going to sleep, but she was more than happy to watch what I was up to. Every so often, her big sister came to get in on the action, which was lovely. Once we were done with the props, we moved Harper on to my posing beanbag. She loved it on there. Mind, it is super soft and cosy! 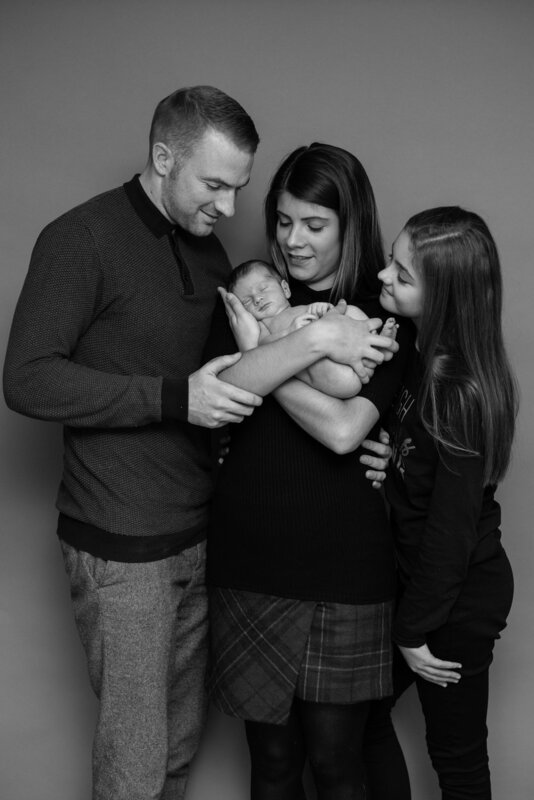 After I took a few of Harper all wrapped up, we moved on to doing my favourite shots..... Parents hands holding their baby on a black backdrop. I don't know about you, but I think it looks awesome! 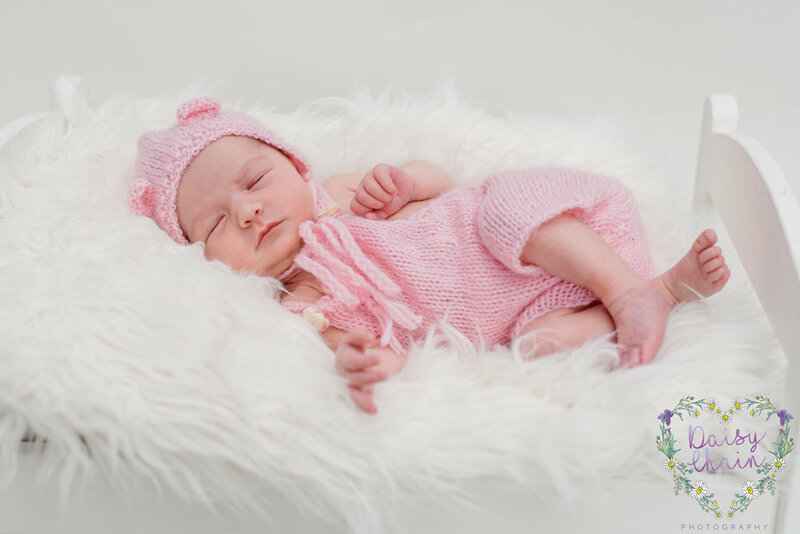 If you are pregnant and fancy a newborn shoot, it can be booked any time after your 20 week scan. It's best to get booked in nice and early as I only book approximately 4 a month. This is because babies have a habit at not arriving on time. This means I have more flexibility with rearranging your appointment. 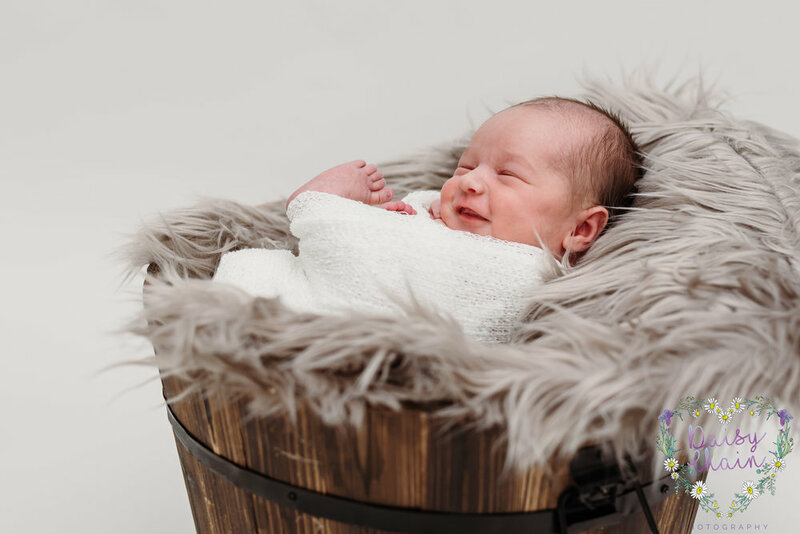 Newborns are best to photograph within their first 2 weeks, ideally between 4 and 10 days old. If you would like to discuss this further, please drop me a message. Wow! What a year 2017 has been. 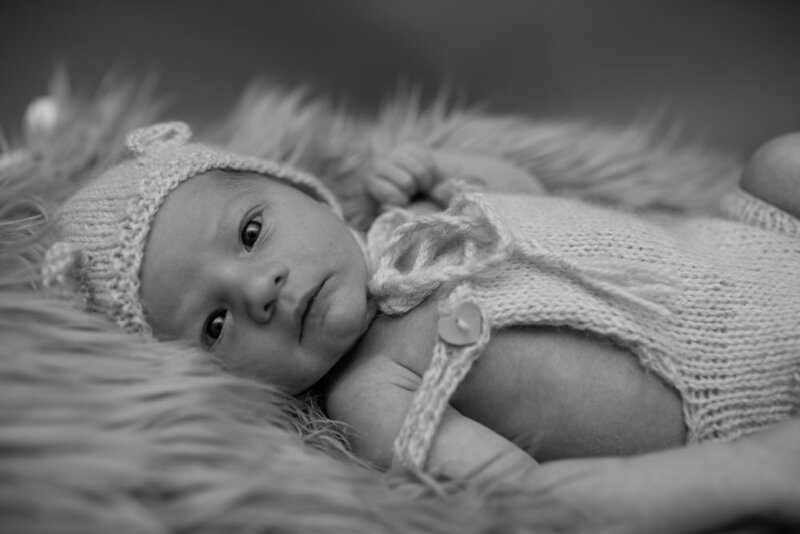 As some of you will know, I am now a Ribble Valley based, Lancashire wedding and newborn photographer. I have always had a keen interest in photography, but never had the guts to to do anything about it. At the back end of 2016, I was having a coffee with a very close friend of mine. She is actually the first friend that I made when I moved from Cumbria down to Lancashire back in 2003. She said she also was wanting to set up a photography business. We knocked out a few ideas and came to the conclusion that we could do it! That evening, I discussed it with my husband. He was ridiculously supportive of it and told me to crack on with it. The day after, I bought myself a new DSLR and did a few model calls to get me started. I went on a training course with my friend, bought a few newborn props and I was ready to go. I spent January and February doing photo shoots for minimal charge, just to get my portfolio going. I then booked myself on a marketing mentoring session with an awesome local photographer, she has now become one of my friends. She added me into a networking group of photographers. They have all been so amazingly helpful and supportive. 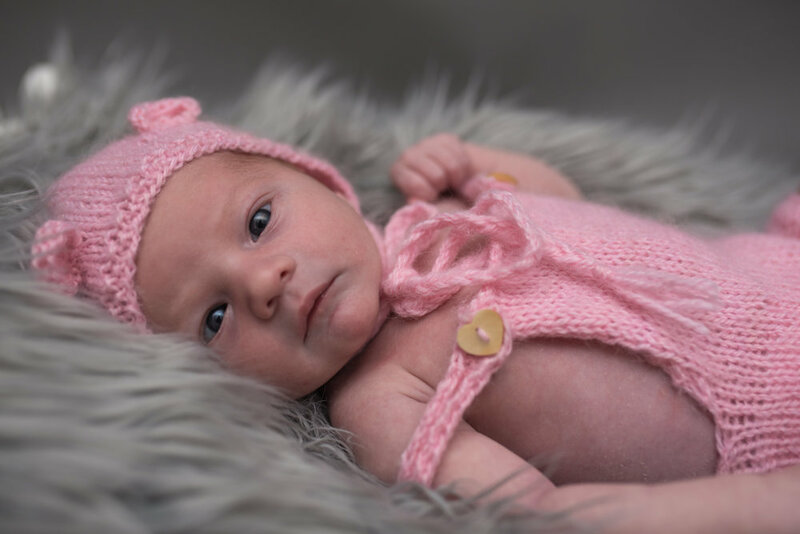 Within that group, I met another local and fantastic photographer and booked on her newborn posing workshop. It was an awesome day and I learnt loads. She has now also become a friend of mine. From there, my business has just grown and grown! Anyway, you know I mentioned buying a DSLR the day after I decided to set up my own business? Well, I outgrew that one pretty quickly and now have two awesome ones instead. 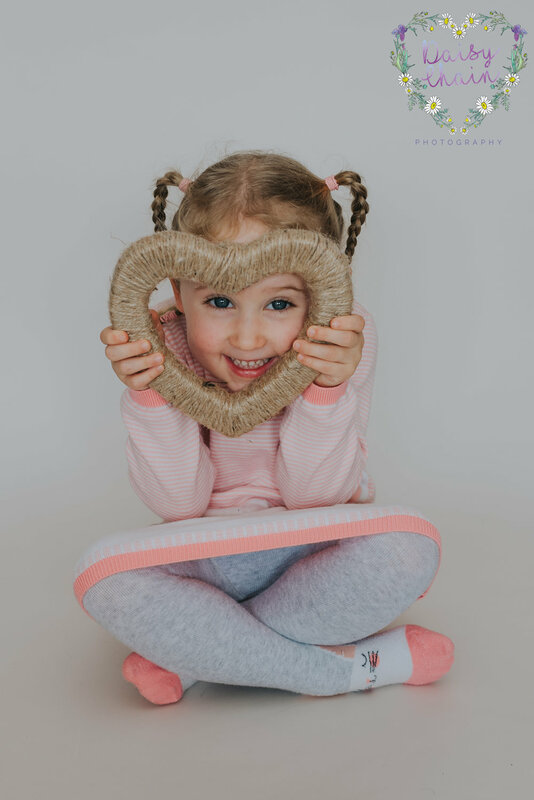 My 4 year old daughter keeps telling me she wants to be a newborn photographer too. I might set her off with my original one in a few years. She can be my apprentice! 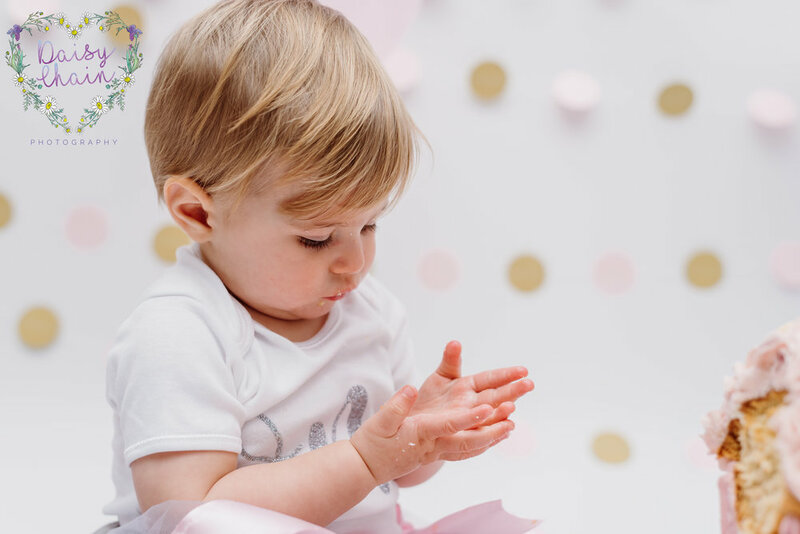 This last year, I have spent the majority of the year focusing on newborns, children, families and pets. I am going to continue with those moving on in to 2019, However, towards the back end of 2017, I started to focus on weddings. The group I mentioned above have really helped with that. I'll speak more about that in my Best of 2017 - weddings blog. Below are some of my favourite images from the last 12 months. If you would like to discuss further or book a shoot, please contact me. Last week, I was recommended as a newborn photographer by a couple of my friends to a lovely family. 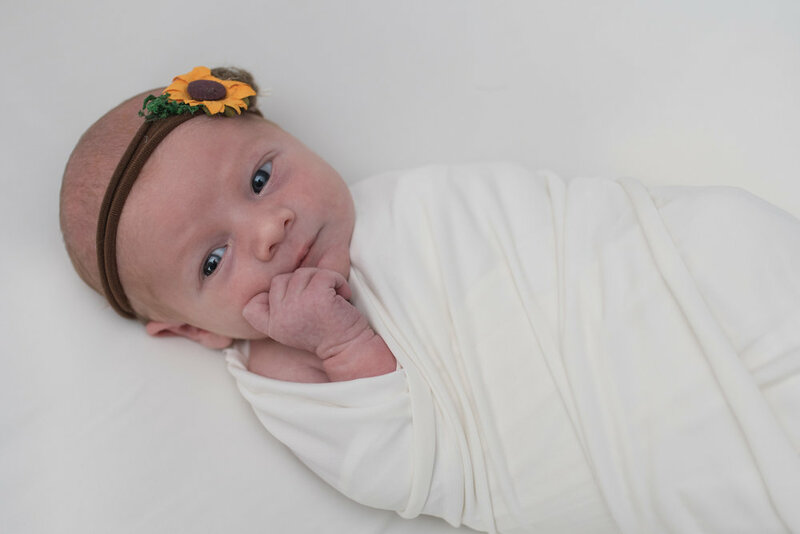 When Isabella's Daddy made contact with me, she was already 4 days old, so I knew I would have to move things around a bit to get her booked in nice and early. Newborns are best to photograph in the first couple of weeks, although ideally the first 10 days. This is because they are more relaxed and sleepy. I am sorry if I have already told you this. Don't get me wrong, a shoot after this stage is no problem, but it is better if it can be done. Anyway, I managed to make myself available for this Sunday just gone. 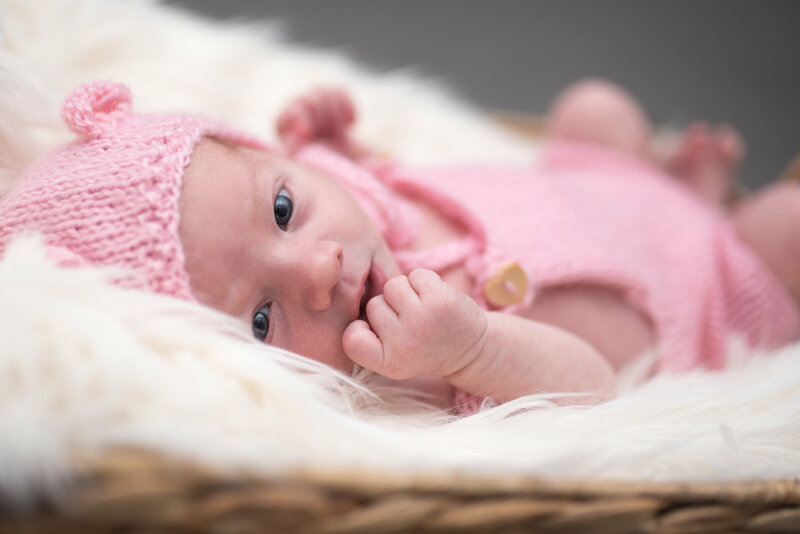 She was now 13 days old and totally beautiful! Anyway, I had already set up everything ready for their arrival. Isabelle brought along her Mummy, Daddy and big sister. She arrived asleep and wanted to party from the minute she woke up. It was no problem. She was wearing a special little outfit that her Mummy and Daddy wanted a few shots of her wearing. 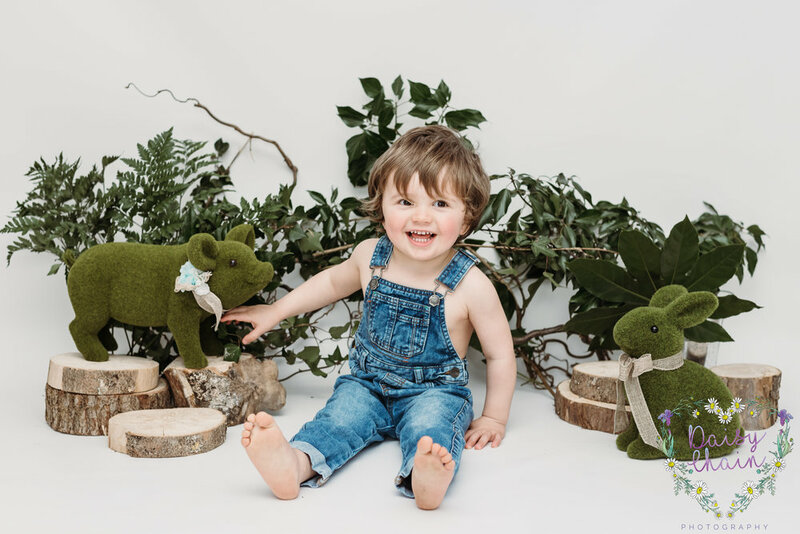 I did that before putting her in my hand knitted dungaree with matching hat set. Isabelle decided hats aren't for her. So I whipped it back off again. She soon settled after some Mummy cuddles and kisses. I used various props to get a variety of images before moving her on to my beanbag. I love my posing beanbag; especially on my black backdrop (you might have gathered that). From there, we went on to do a group shot. 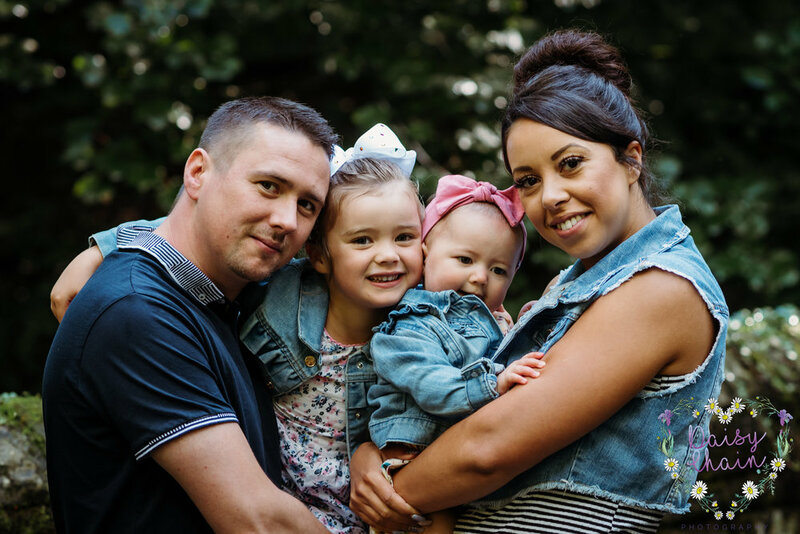 This family were amazing to shoot as a group. They were all so relaxed with each other. I couldn't get enough of them! Isabelle's Daddy had asked if they could bring along matching Christmas onesies. Well, it would have been rude to say no! And I am so glad that I didn't. They all looked amazing! After we had done this, Isabelle and Daddy decided they wanted a special photograph together. Isabelle was naked in Daddy's arms. At this point, Isabelle had a little accident, twice...... Lets just say that Daddy traveled home in his Christmas onesie. I didn't laugh as they drove away...... much! This family were so amazing. The love they all have for each other is incredible. I look forwards to working with you again in the future.